A pilot project to use wireless and VoIP technologies to deliver communication services to rural areas in Bhutan, a small Himalayan Kingdom, was completed with encouraging results. Once initial problems with radio interference from other sources were solved the 802.11b radio network became reliable. This allowed the VoIP equipment to be tuned to accommodate the more variable nature of a wireless network as compared to a wired one. International calls through the PSTN were hampered by a slightly non standard R2 protocol spoken by the local switch. This underscores the importance of adhering to open standards when many subsystems must work together. Good communication services and universal access are necessary for a higher standard of living and economic growth. 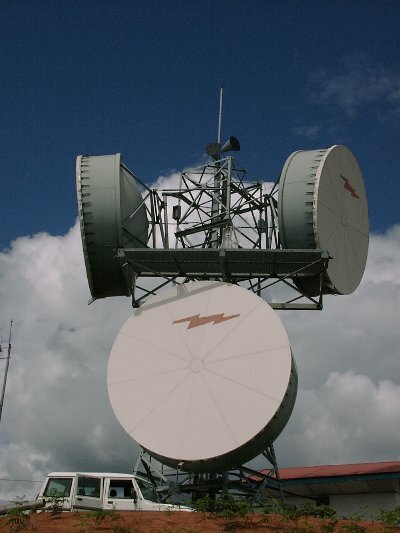 However the high cost of legacy PSTN equipment may not be affordable to some developing nations, especially in rural areas which have a much lower subscriber density, or areas with geographic challenges such as large bodies of water, jungles, mountainous terrain etc. There are several paradigm shifts happening in todays telephony markets which are driving costs down by orders of magnitude. First legacy telephony systems are based on Circuit Switched Networks or (CSNs) This means a telephone call is allocated a dedicated circuit from end to end. In the old days this meant a physical pair of wires for the audio to travel over. Today this typically means two 64Kbps channels one in each direction which are dedicated to that call even if no one is talking, and since usually only one person is talking at a time about half of the bandwidth is wasted. For example, a typical small PSTN trunk can carry 24 or 30 simultaneous calls. If the bandwidth were used more effectively the circuit could carry much more if not almost twice as many calls. On the positive side CSN technology is very robust and predictable which made it easier to build reliable telephone networks in the early years of the industry. Because these PSTN switching systems were very big and centralized due to the state of the art at that time, they were very expensive and relatively few were sold to big companies like AT&T. So the market never developed to a point where the prices could drop significantly. When computer networking technology was developed it was based on Packet Switched Networks (PSNs). Instead of dedicating a circuit of a predetermined bandwidth to two endpoints, packets are sent with little messages inside as each party has something to convey. This utilizes the bandwidth much more effectively. Instead of slicing it up into little pieces that are reserved but not being used half of the time, it is all consolidated in one big pipe that is only used when data actually needs to be sent. As the computer revolution evolved and the Internet grew exponentially so did the market for PSN technology products. This caused prices to fall by orders of magnitude. Another Paradigm shift that is in progress now is sending audio on a data network rather than sending data on an audio network. Using modems over a Legacy PSTN is an example of the latter. This is a very unfavorable combination because the modems at both ends usually send a carrier signal even when they have no data to send, and even though the PSTN eventually digitizes the audio it knows nothing about the data encoded by the modem so both 64Kbps channels are constantly in use even though the modems are not sending any packets. The phone companies saw that this wasn't working very well and that there was a demand for lower cost data circuits, and started providing services like ISDN, Frame relay, and eventually DSL, and ADSL. These services were designed to let the PSTN handle the communications as data and not audio. But ISDN still used a dedicated 64Kbps or 128Kbps channel so this approach did not capture a large portion of the achievable efficiency. The others had a quality of service metric known as Committed Information Rate or (CIR) which was usually set lower than the maximum bit rate of the Circuit, and paved the way for the consolidation of circuits into one pipe. These were some of the first steps taken in the transition from CSNs to PSNs in Telecom networks. As high speed wide area networks (WANs) became more affordable and Voice over IP technology developed to become a commercial product thanks to standards organizations like the ITU and IETF, more and more organizations started buying high speed data connections between their offices and providing data and inter-office phone service over these links. Also many Internet Telephony Service Providers (ITSPs) started selling low cost long distance service over the Internet. One limitation of this technology that may slow down the complete conversion to an audio over data network is that there needs to be power at the subscribers site for the terminal equipment. Legacy telephones are powered only by the PSTN so they will still work if there is a power failure, and this is often when it's needed the most. 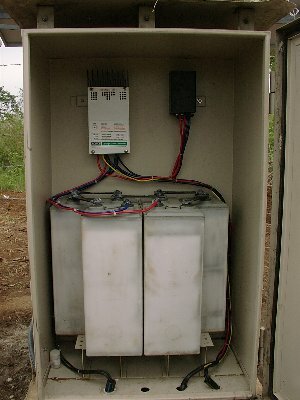 The PSTN is able to provide this by having a battery bank and generator at each switching site. To provide a reliable VoIP system it is usually necessary to have battery backup at each subscriber site. Telephony equipment manufacturers could no longer ignore the compelling nature of these new communications paradigms, and now no one is building big switches anymore. Most of the new telephony products are based on PC platforms with Compact PCI cards at this time. Data rates on wired networks have been increasing by powers of ten over the years, and more recently wireless rates have been catching up. This is due to many factors. Among them are the commercialization of spread spectrum technology, improvements in IC manufacturing processes to fit these radios on small cards, and the allocation of radio spectrum in the Gigahertz range for licensed and unlicensed use of these devices. The advantages of wireless networking are hard to ignore and the market for wireless Network Interface Cards (NICs) grew rapidly. Soon they too became commodity items. Initially they were targeted at networks within office buildings and homes, but many users found that they could also be used for long distance communications if the systems were designed properly. This use also became popular and another market grew which provided low cost high quality antennas and amplifiers to increase the range. 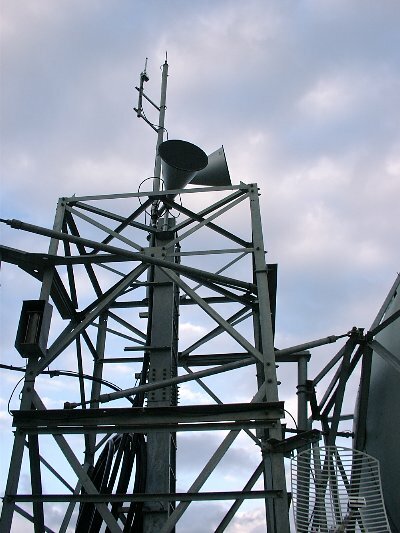 This became a low cost alternative to the Microwave links used by the Telecom and broadcast industries, though at not quite the same level of performance. Currently there are products available that work at 11, 45, 100, and 1000 Megabits per second. Though one should note that the expected throughput will be about half of the data rate, and generally the higher the speed the shorter the usable range. Wireless telephony is nothing new, there are microwave links for the trunk lines and Wireless Local Loop (WLL) for the subscriber terminal equipment. But it's mostly CSN based technology and is therefore quite expensive. If one combines a network built out of commodity wireless cards with Voice over IP equipment it is a low cost delivery infrastructure that makes efficient use of the bandwidth it provides. Additionally one gets a high speed data network that can also provide Internet access. Of course its not quite that easy. Each radio repeater needs battery backup, and as mentioned before so does each subscriber. Also because of the change from the CSN model to PSN it will be necessary to manage the bandwidth usage so that priority is given to voice traffic and that too many calls are not allowed to be placed simultaneously. This was not an issue with the legacy CSN systems because there were only a finite number of slots on the trunks for calls and when they were out of slots one got an all circuits are busy message. Overall rapid growth in this area is expected, driven by fierce competition in long distance rates, and the large populations of people currently without good communications services. To deploy such a wireless VoIP network at two sites serving a total of about 80 customers. To evaluate the performance of a wireless point to point backbone link. To evaluate the performance of the point to multipoint last mile links. To evaluate the performance of the VoIP service over the links. To evaluate the overall usability of the wireless network for VoIP. To evaluate some low cost routing hardware used for the E1 data connections. To gain experience in deploying these systems. To understand better all the issues involved. To fine tune the radio network to increase it's reliability and usability. 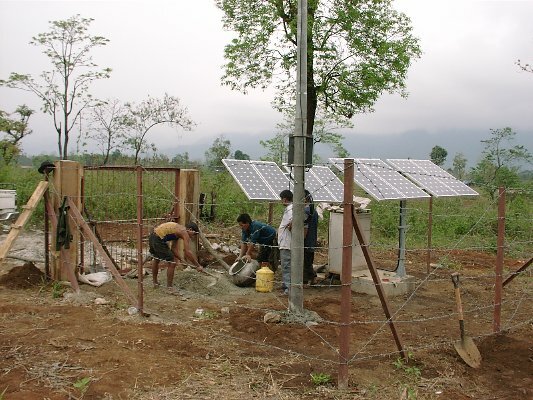 To eventually have a usable system that can provide service to the two rural areas. 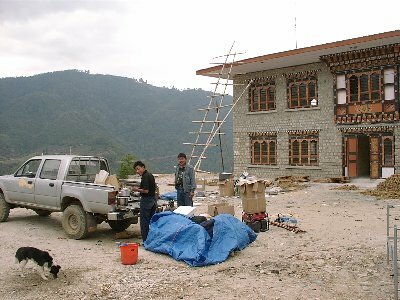 In the spring of 2001 the Consultant came to Bhutan as a UNV specialist attached to the Department of Information Technology (DIT). The Consultant demonstrated some wireless gear with a usable range of about 8km from a PCMCIA card in a laptop to a repeater and a similar range for some VoIP wireless phones. A proposal for this pilot project was drafted which can be found here . Some more research was done on the equipment list and pricing, and in August the funding for the project came through. 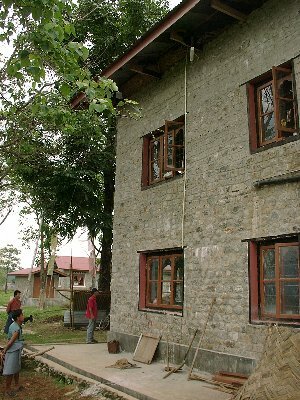 The Consultant returned to Bhutan in the spring of 2002 to complete the project. Fig. 1 Limukha Area Diagram. In the Limukha area shown in figure 1 the E1 link ends at Dulchula and the last hop is done over a prototype backbone link which brings the network to Limukha hilltop. Don't be confused by the dish icons in the diagram they really do point at each other. 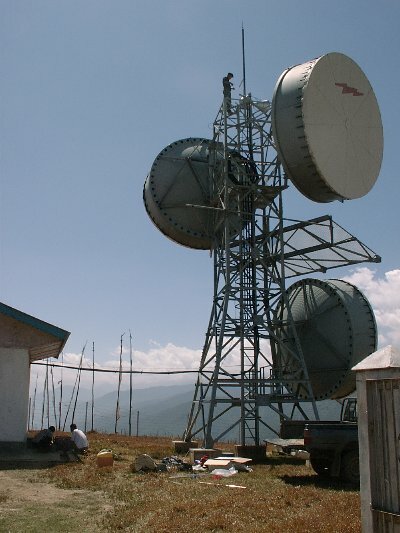 On Limukha hilltop there is also an Omni repeater which serves three Customer Premise Equipment locations (CPEs). 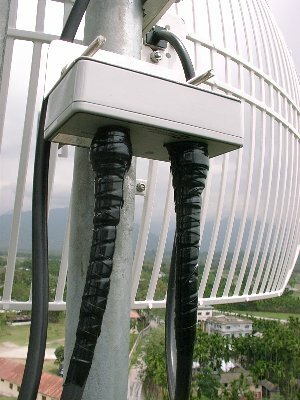 Talo Ridge separates Limukha from three other CPEs so we have the Talo omni repeater to cover those. 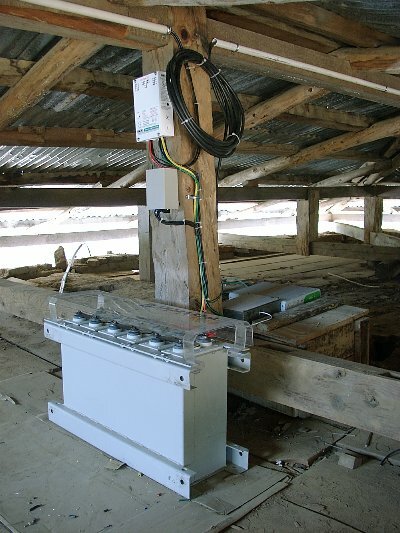 In The Gelephu area, (figure 2) The E1 link terminates at the PSTN switching room in Downtown Gelephu. The Microwave tower there was used to mount the equipment to cover the surrounding areas. Because the design was very conservative two dishes were used to reach the outlining areas and one omni to reach closer CPEs. Happily it turns out that the omni was able to also reach one of the outlying areas. In each of these three areas there is a repeater to serve the local CPEs. In this project each CPE provides either four or eight analog phone lines. The Limukha area has six CPEs serving about 36 customers. 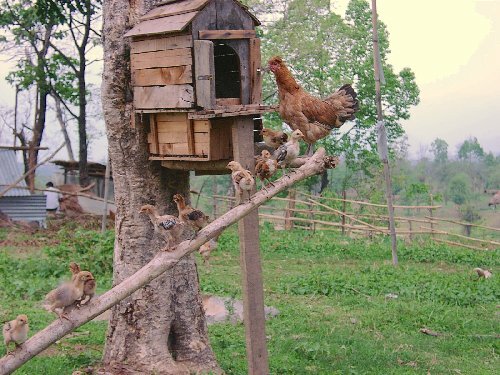 The Gelephu area has Eight CPEs serving about 44 customers. The constraints involved designing a high speed data radio system are very similar to ones in a WLL or cellular system. Everything needs to be Line Of Sight (LOS). This actually means a path which is also free of nearby obstructions such as corners of buildings and rooftops, not simply being able to see the other antenna. This is because there is something called the Fresnel zone around the centerline of the LOS path. Objects in this zone are likely to refract some of the signal toward the antenna and cause it to be attenuated. Of course sometimes one can get by with things in the way like a few wispy trees etc. But it's not a good idea and when the leaves get wet they will adsorb even more of the signal. The range one can get out of each link depends on several things. The most important is probably the chosen frequency band. Because this project focused on a solution using commodity wireless hardware, this meant one of the ISM bands. Namely 2.4GHz or 5.8GHz. The trade off here is the higher frequency allow for higher data rates but shorter ranges, and more rain fade. So more power will be necessary to make up for the loss of signal strength when it rains or snows. At the time of this report 802.11b devices worked in the 2.4GHz band and provided data rates up to 11Mbps, and 802.11a and others worked in the 5.8GHz band and provided rates up to 50 and 100Mbps. 802.11b equipment was chosen because of the lower cost and higher availability. For a quick introduction to 802.11b please see [20.5]. Once the band has been selected, the other factors influencing range can be adjusted: output power, receiver sensitivity, antenna gain, and data rate. Increasing any of the first three or decreasing the data rate will cause the expected range to increase. It is important to also allow some margin for rain fade. The Project chose to put amplifiers on the repeaters and slightly higher gain antennas on the CPEs. A conservative rule of thumb for range is to try to limit the distance between repeaters and CPEs to about 8km. It was beyond the scope of this Project to explore the maximum distance between the repeaters but most manufacturers publish sample performance data for different configurations. A conservative estimate would be about 12-15km between 8dBi omnis and about 25-30km between 24dBi dishes using one watt amps. Of course the regulations concerning transmitter power, EIRP, and antenna gain will vary from country to country. There is a good discussion of the US regulations here [20.2]. To build a full network a backbone is needed to deliver the bandwidth to the clusters of customer sites. Ideally the backbone should be much faster than the last mile delivery system so that many sites can be aggregated onto it for transshipment around hither and yon. Also because the backbone is a point to point system, one could take advantage of this and design it to be full duplex. This would more than double it's capacity, and lessen delayed packets due to collisions. This in turn would allow the maximum transit time of packets from one end of the network to the other to be much more predictable which is a consideration for VoIP and other real time data. In this phase of the project there wasn't enough time or budget to explore a higher speed or full duplex backbone. It's interesting to note that as the number of calls in progress went up so did the collisions and retries. This is very understandable because as was mentioned before a call sends data in both directions and on a half-duplex link this means the two ends have to take turns sending on their shared frequency. Because 802.11b provides so much more bandwidth than is used for a moderate number of simultaneous calls, the collision rate is acceptable and the voice quality should be unaffected. On a system intended to run at near capacity one should seriously consider a full duplex high speed backbone. The most likely candidates seem to be 5.8GHz equipment with amps, perhaps on non-overlapping frequencies using horizontal and vertical polarizations for further isolation. The last mile delivery is typically structured with one or more repeaters serving the surrounding customers which need LOS or Near LOS (NLOS) to a repeater. 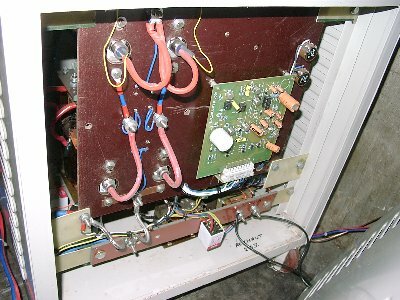 In order to account for rain fade and get better range each repeater in the system has a one watt amp to boost the transmit and receive signals. For the repeater antennas 8dBi omnis were chosen. These seemed to be a good balance between gain and a radiation pattern which wasn't too flat. This also provided service to customers who were below the antenna at about a 30 or 40 degree angle. 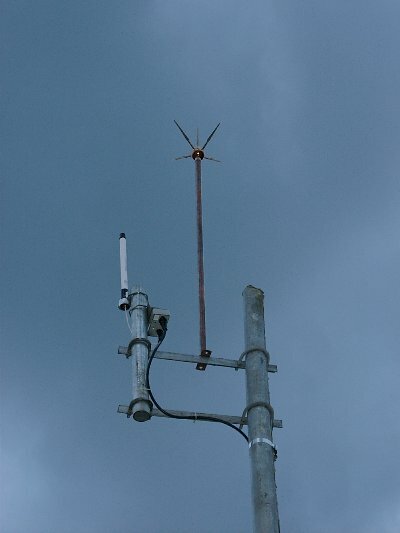 For the Customer sites 13dBi Yagi antennas were used since they were always served by one repeater and it wouldn't have been cost effective to put amps at each customer site. In cases where there is one CPE site way off by itself, it would be preferable to use an existing repeater if possible. In this situation adding an amp to a CPE site would be a viable solution. There are variations on this scheme where the CPE sites all talk to each other using 802.11b "ad hoc" mode and or a meshing protocol, but the available bandwidth typically goes down quite a bit and eventually a repeater will be needed somewhere to get back to the backbone. One should also consider how much bandwidth a community needs when choosing the last mile delivery technology. 802.11a and others can provide upwards of 25Mbps but as mentioned before the range is less. Since there are usually several non-overlapping frequencies available , either technology can be scaled up to easily triple the aggregate bandwidth in an area. Most customers who need a telephone line and perhaps an Internet connection can easily be served by 802.11b. Some organizations like hospitals and large government offices might require the higher rates available in the 5.8GHz band and the two delivery systems could compliment each other in these areas. There is a lot of market pressure to provide a wireless broadband solution as can be seen by the many new proposed standards. See table 1 above for a few, such as 802.16 , or 802.XY . Recently the NY Times reported that some entrepreneurs say they have solved the LOS restriction for 80.11b . Most likely future projects will be able to take advantage of these new technologies as the bandwidth needs of rural areas increases. At the NOC in Thimphu were the VocalTec servers, and Flytech routers all on one subnet. Figure 3 shows how it was initially set up, with photos in figure 4. Note that in figures 3, and 18 there is only one tower at each site even though there may be multiple tower icons. The network manager centralizes the management functions of for the VoIP network. The Gatekeeper controls the placing, routing, and logging of calls. The Real Time Server (RTS) logs the calls in real time, also known as Call Data Records (CDRs), and updates customer accounts. The billing server takes the account information and generates statements. 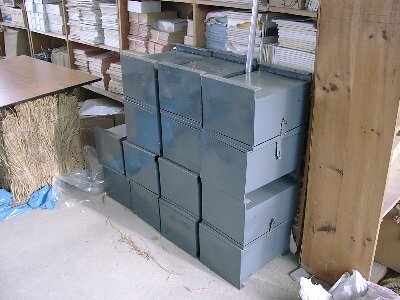 The RAID array stores the Data Bases. The PSTN gateway connects via an E1 line to the PSTN using the R2 protocol. An E1 can carry 30 calls at one time so 30 of the approximately 80 customers could call numbers on the PSTN side of things at once. Additionally almost any number of calls to other VoIP phones could be happening simultaneously. Of course statistically only about 10% to 20% of a population will be using their phones at any given time. That is unless you have a high proportion of teenage girls. 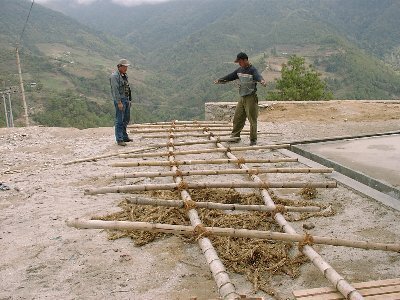 Dochula is the last mountain pass on the way to Limukha, and where the prototype backbone link was tested. Since it was only one hop to Limukha this could be considered a partial test. This was a point to point link configured with it's own SSID, on a different frequency from the Limukha omni, and this allowed it to run with little interference from other segments. At Limukha was the radio for the other end of the backbone and one to serve the Limukha area. They were connected together by a 10BT crossover cable. Recall in Gelephu there were three radios intended to serve two outlying areas, and a closer one. These were set up as root radios  on different frequencies. All had the same SSID though one could force clients onto a particular radio if they were assigned different SSIDs. These were the main repeaters for the project. There were also secondary repeaters to extend coverage over ridges and into low lying areas. The two project sites each had a large subnet that was further divided down into smaller subnets containing each repeater and the CPEs that they served. This helped organize things a bit. Recall that the 802.11b standard was chosen for the Project's radio gear. Initially the plan was to build the radio networks in each area from products of different 802.11b manufacturers but there didn't seem to be enough time or energy to do the additional research. Also the two top contenders Cisco/Aironet [20.8] and Orinoco/Wavelan [20.9] were very similar in price and performance according to the benchmarks so it was decided to simplify things a bit and just go with what seemed likely to work the best. Each manufacturer seems to have their own terminology for things and what the 802.11 industry calls an Access Point (AP) Cisco/Aironet calls a bridge. Probably because the Cisco equipment also acts as a network bridge. By the way, Orinoco/Wavelan calls their's Outdoor routers. At the time of this project Cisco had two product lines that were considered. The older 340 series which are basically the Aironet products unchanged and the newer 350 series. For the repeaters BR342s were used which have 100mw output, and have come down in price slightly since the 350 series came out. One should note that there is quite a lot of variability in the 802.11b PCMCIA cards on the market. Most are only 30mw output as are the 340 series cards. However the Cisco 350 series PCMCIA cards are one of the few with 100mw output so a few of these were purchased for experimenting with and site surveys. Recently 200mw cards have also became available. If one looks at the 802.11 products closely they will notice that most of them either are just a PCMCIA card, are an adapter from a PCMCIA card to another form factor, or are a single board computer with one or two PCMCIA cards in it. Recently a few other form factors have come to the market namely Compact Flash (CF) and Mini PCI (PCI). From this it's clear that the radio components are always packaged in a popular small card standard and additional functionality is built around it. When comparing the price/performance of different products it's good to keep in mind the hardware/software costs. For example 802.11 PCMCIA cards vary from $50 to $100 or so, and Single Board Computers (SBCs) can be mass produced for $150 plus or minus. So a low end AP should cost about $200 and they do. But compare that to a high end unit like the Cisco BR342 or Orinoco Outdoor router and one wonders why the cost is on the order of $1000, many times higher. The answer is software and the companies good name. Orinoco makes this obvious by having several products that use the same hardware platform which can accept one or two of their wireless cards and are distinguished by the price / feature set of different firmware versions. A more cost effective and flexible solution would be to take advantage of the new SBCs that are coming out on the market like the Soekris , and Musenki  SBCs. Populated with the wireless cards of one's choice they can be configured for virtually any situation. When a new wireless card becomes available just download the drivers and try it. One is not locked into a particular frequency band, data rate or vendor. There is a broad spectrum of free software available for these boards, with contributions from many people all over the world. One is not limited to the feature set offered by just one company. Additionally this supports a philosophy of using a small number of modules to be used in different configurations depending on what's needed at each site. This way the inventory of different spare parts can be reduced. For example PCMCIA cards can be used for repeaters, CPEs, or laptops. SBCs can be used for repeaters, CPEs, VoIP gateways, or wired E1 routers. All using very similar software. Because the VocalTec equipment was not wireless, each CPE also needed a wireless client adapter. Commonly these are PCMCIA cards but a stand alone device was called for here. The Avaya Wireless Ethernet Converter (EC) [20.3] was used and worked well for this pilot project, though it had some shortcomings. Originally all CPE sites were to have just one GW each. However for various reasons a couple of sites got rearranged or consolidated so that there were two GWs at these sites. The Avaya ECs could only handle just one network device on the wired side so this new arrangement didn't work. Apparently there is a Linksys product that will do full bridging [20.4], but is not clear weather the AP also has to be a Linksys or not. The other missing features for these products are that there is seems to be no way to monitor signal strength or to use SNMP with them. Because 802.11 is simplex system, ie. the radios transmit and receive with the same antenna on the same frequency, when using amplifiers they need to be bidirectional. These will amplify the receive signal as well as the transmit, but they cost quite a bit more than unidirectional amplifiers which can be used on full duplex links. There are several vendors of bidirectional amps, Hyperlink [20.6]and YDI [20.7] are two popular companies and their amplifiers seem to be similar in price / performance though the Consultant doesn't have much experience with YDI. Hyperlink also sells antenna kits with their amps which are competitively priced. The 802.11 repeaters used the Hyperlink 2.4GHz one watt amps. Full duplex links typically use separate transmitters and receivers each with their own antenna. If a full duplex link were to use amps then then a transmitter would use one to amplify the transmitted signal, and a receiver would use a different type of amp to amplify the received signal. These amplifiers are cheaper to build because they only amplify in one direction. 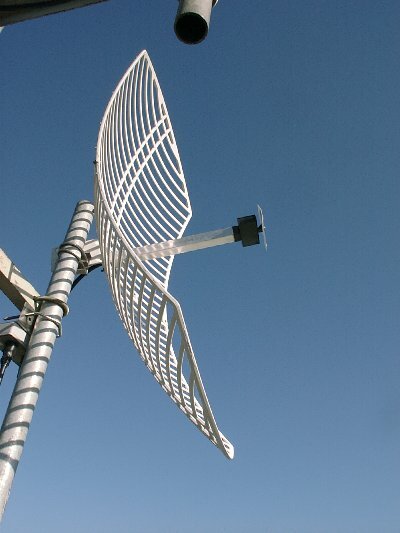 Antennas vary in price quite a bit, and one can even build their own without too much trouble. Hyperlink has a good selection of moderately priced antennas, and will give one a discount if they order a kit. The Omnis and Yagis are about $100 and the dishes have come down a bit to about $70. Most of the 802.11 antennas on the market are readily available with weather proof plastic enclosures (radomes ) except it seems, the dishes. This makes it rather expensive to design backbone links where there is snow and ice. For CPE antennas next time the Consultant would recommend Yagis from this South African company [5.1]they seem very solid and weather proof and are only $28[5.2]. It's helpful if all the mounting hardware uses readily available nuts and washers because one will lose more than one cares to admit by dropping them off of towers or roof tops. Also u-bolts can be easily made from long pieces of threaded rod sometimes called all-thread. It's good to keep a supply of several sizes handy along with a box or two of nuts and washers. Also it can be used for mounting to concrete footings. 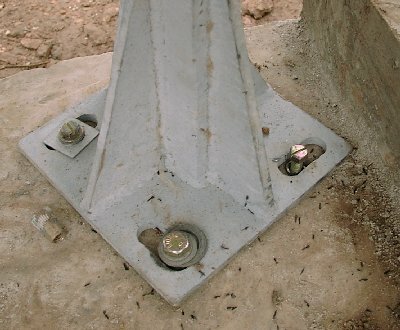 Figure 5 shows some examples of the problems one can encounter fastening to concrete footings. 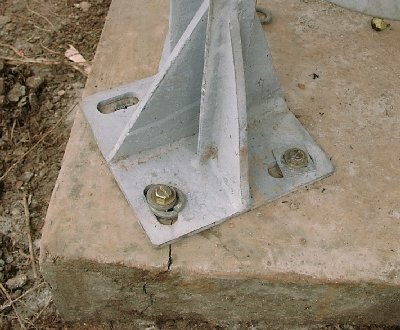 The intention of course is to pore the concrete with the bolts in place so the installing crew can come along later and bolt down the equipment mounts. Usually this requires too much coordination between the two crews so the concrete is pored without bolts. Then the installing crew comes later and drills the holes. So far expansion bolts have been used but as one can see in figure 5 that there can be problems with the concrete cracking when the collar expands, or just finding the correct sizes of bolts, expansion collars, and washers can be tough when supplies are running low. The Consultant recommends using all-thread and epoxy anchoring compound [5.6]. This way the same supplies of all-thread, nuts and washers can be used for anchors as well as u-bolts. It's important to waterproof cable connections properly. One way is with special rubber tape that self seals to itself once applied. 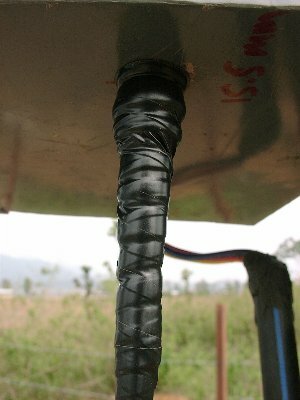 It's very important to cover the rubber tape with a UV and weather resistant electrical tape because the rubber tapes will eventually crack and breakdown with prolonged exposure to sunlight. See figure 6 for examples. One can also use a brush applied waterproofing compound such as ScotchKote [5.7]. Another handy item is epoxy putty for sealing holes in roofs and the like. The common brand name in Bhutan is M-seal. Of course wire ties are a good way to dress cables but don't use them on lightning ground wires because they will melt. It's better to use stainless steel straps instead. The thought here was to demonstrate the viability of open systems and especially open source software solutions as alternatives to more expensive commercial products. Briefly, the Consultant put together very small computers with E1 cards running Linux which served as routers at the ends of the microwave E1 links. For more details on their configuration and maintenance please see the Flytech training manual . The Flytech boxes did meet most of these expectations. They excelled at being flexible and provided a work around for an apparent problem with the Cisco Bridges. Also they were much more capable than a mere router needed to be, which was a double edged sword. On one hand it allowed network monitoring and logging to be done from one box (See section 10.2.2), on the other hand the system image was quite large and this made it a bit awkward to back them up. Because they were essentially small PCs they suffered from some of the same limitations, such as a risk of file system corruption when there was a power failure, and the possibility of hard drive failure. Because they are so flexible they may require a little more skill to administer if one is contemplating adding features. Though for the usual additions to the network, typically only one file needs to be edited. If one agrees that this is a good direction to go and that the flexibility gained was a factor in the success of this project then most of these issues can be addressed. The possibility of file system corruption can be almost completely eliminated by using a journaling file system. The Consultant has done this on other Flytechs and no longer has to worry about power interruptions. The Hard drive can be replaced with a compact flash card since the Flytech's have a CF slot. The tradeoff here is that there is limited space for additional applications and no space for logging large amounts of data. On the positive side back up is a breeze, and administration tends to be simpler because the system is smaller and more focused on one task. For sites with battery power there is also a DC supply option for the Flytechs. All in all the Flytechs did their job well, but they were probably overkill. The cost for a Flytech was about $2000 total, comparable to a Cisco router which is much less capable. Though if the system monitoring is to be done from another server then the routers could be scaled down somewhat with a similar reduction in cost. The Soekris SBCs might be able to replace the Flytechs someday when an E1 card is available for their Mini PCI slot. Soekris has plans to come out with such a card but the timing isn't certain. This configuration might cost around $500 to $1000 USD but that's just a guess. For the VoIP component of the system there are a lot of considerations but due to time constraints the Consultant feels that some were left unaddressed. Still a reasonable choice was made that worked adequately. Initially there was interest in wireless VoIP products, and at the time of the research there were only one or two on the market. Primarily the search was for a fixed wireless VoIP residential gateway rather than mobile wireless VoIP phone. E-tel provides the former in their GW210 model , and Symbol's NetVision phone  is an example of the latter. The Etel GW210, even though it was only a two port unit, was felt to be cost effective because it combined the VoIP and wireless components of a CPE into one unit. However it was difficult to confirm that it would interoperate with any of the gatekeepers (GK) that the project was looking at. In hindsight E-tel's list of GKs that were compatible with the GW210 could also have been checked into and then billing systems that worked with those could have been found. Eventually VocalTec  was chosen as the supplier of the VoIP equipment for several reasons. A complete solution with a billing system was needed. They were very helpful, and in fact they were one of the few vendors that returned phone calls. Also the project had the usual time constraints and they seemed to be the only choice when it was time to make one. VocalTec was unable to interoperate with third party gateways (GWs) so other products could no longer be considered, but this also had it's advantages because the two viable models had four and eight ports, compared to most (but not all) of the others that had been looked at which were one or two port units. This allowed the CPEs to be consolidated so they served a small cluster of buildings with one antenna. This is preferable to many CPEs and antennas because there is less contention for the radio channel. VocalTec recommended the Mind billing system, a third party product which seems to be working well. Again if there had been more time there was already an in house billing system in use by the ISP branch of Bhutan Telecom (BT) and it might have been possible to adapt that one to the VoIP project. Especially since there were local programmers who maintained it. As noted above, one of the other differences between a legacy telephone system and a VoIP system is that the CPE must be powered locally at the Customers site. This is because there are no wires to carry the power. Now if one were considering a wired VoIP system using 10/100BT then they could take advantage of a new development called Power over Ethernet (PoE) which runs power over the Cat 5 Ethernet cable. In this case though the power had to be provided locally, so instead of a centralized and easily manageable bank of batteries at the Switching center one needs batteries at each customer site along with a charger and Low Voltage Disconnect (LVD). At sites that had commercial power a battery charger that had a built in LVD was used . Apparently there weren't a lot of choices locally for this product and the one that was available was not a great match for this application. The unit was larger and heavier than it had to be (figure 7). Also it seemed impossible to get documentation for it, and it appeared to be malfunctioning. Eventually an unlabeled LVD adjustment was discovered (Fig 8 d) and, that it was not set properly at the factory. In fact they seemed to be set randomly on each unit. So trips had to be made back out to the CPE sites and readjust the LVD set points. This was after a couple of batteries were damaged. The lesson here is carefully research the products for one's system. Even though it is better to buy locally it still may not be the wisest thing to do. 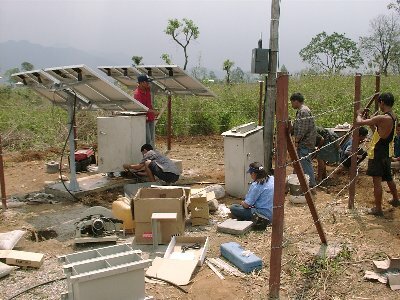 For sites where commercial power was unavailable solar panels and charge controllers were used. 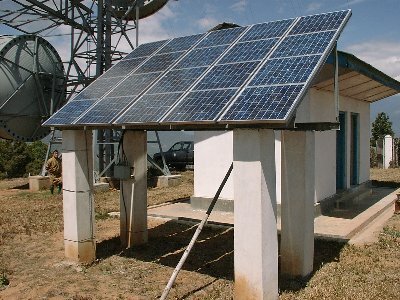 There were both repeater and CPE sites which used solar power. The panels were purchased from Tata BP solar and were 70 watts each. The Consultant recommended charge controllers with integrated LVDs, and suggested several such solar chargers during the selection process . But apparently there was a lot of pressure to get the project underway and not enough time to evaluate them all. An outside vendor recommended the Trace C35 and C40 thinking that they also had LVD options, This is an understandable mistake because they can indeed be used as an LVD but not when they are configured as solar charge controllers. Also the specifications can sometimes be ambiguous, when in doubt it's best to contact the manufacturer. This was still an excellent choice because trace produces some of the highest quality alternative energy products on the market. Eventually a standalone LVD was found to work with the C35 but it's quality was suspect. As these examples show it can sometimes be difficult to find units correctly sized for a site with all the desired features. 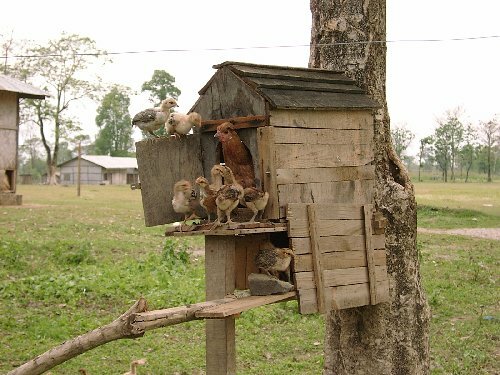 In this case building one's system out of several smaller units which better fit the constraints is probably advisable. In this instance the high cost of quality LVDs , or the low quality of locally produced units seemed to be an issue. The Consultant eventually did further research and designed a very low cost (VLC) LVD which could be used for any repeater or CPE site. The parts cost is around 10 to 15 USD. See Appendix A.1 for details. 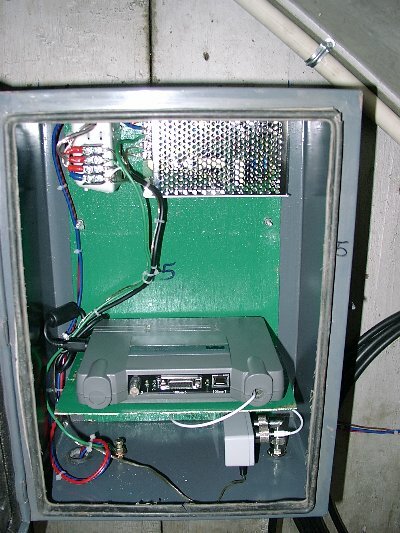 There were several solar powered CPE sites which required much less power than the repeaters, and it seems there are quite a few small charge controllers with LVDs available. Though the Specifications are not completely clear on this matter the Trace C12 seems to be LVD capable when it is configured as a charge controller unlike the C35 and C40. In any case the reliability of future CPE sites would benefit by having integrated Charge controllers, and LVDs. Also note that when the sun is shining that no part of a solar panel should be shaded. This is because a great number of cells in a panel are connected in series, and that when shaded, a cell will act like a resistor. This will greatly reduce the output of a panel even if only a corner is shaded. The solar repeater sites were sized such that they could operate from batteries for eight cloudy days in a row and be recharged in three. During cloudy days the panels will only put out about 10% of normal but to be conservative it is assumed to be zero. To calculate the size of the solar array and battery bank it helps to make some approximations. First the output of the solar panels need to be averaged or "derated" over a whole day because they will only give their rated output during high noon and if they are not too hot. In fact many solar manufacturers rate their panels at 25 Degrees C but they are usually much warmer and so put out less power. Also it is convenient to talk in terms of amps and amp hours even though batteries change voltage with their State Of Charge (SOC) and the number of watts per amp hour will actually vary. For the calculations one starts with the power draw of the load, for the repeaters that was usually 18 Watts. Then one needs to estimate how many hours of direct sun light the panels will usually get on a sunny day for a given site. Six were used here, please see table 2 for example calculations. First note the size and deratings of the panels and batteries. Then calculate how many amp hours the load consumes in a day. Also during the eight day autonomy period. This gives the needed battery bank capacity. Days autonomy * Amp hours/day = Total amp hours for autonomy period. because it will cut their expected lifetime almost in half. Amp hours of autonomy / Percent usable = Battery bank size. after a full eight days of cloudy weather. Now find out how many amps are needed during the sunny part of the day. sunny part of the day to break even with the battery drain at night. Load Ah per day / Hours of sun per day / Charging efficiency = Load sun amps. overestimate ones power usage a bit. Then get the average amps each panel can be expected to produce. Now one can easily calculate the number of panels needed. Total amps / Amps per panel = Rounds up to number of panels. Last but not least do the same for the battery bank. Battery bank size / Each battery = Rounds up to number of Batteries. 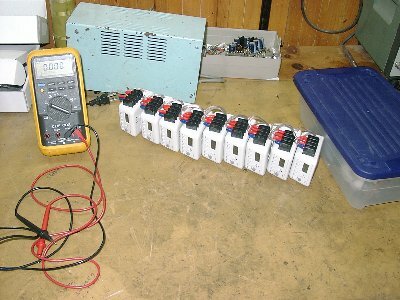 In some situations one could save some money by installing a Maximum Power Point Tracker (MPPT) which allows the panels to supply current at their most effective operating voltage rather than whatever voltage the batteries happen to be at. There are claims that these devices can get an additional 25% to 30% out of the panels but this is often not realizable. Still in certain cases they are warranted . If one used an MPPT as a charge controller then the above calculations would be more accurate if they were converted to use Watts and Watt hours instead of Amps and Amp hours. One can get a hint of the difference this might make if the solar panel wattage is divided by the nominal battery voltage (12V) instead of the solar panel working voltage (17V) in step 10 above. One MPPT on the market that seems to be sized right for the CPEs is the B.Z. products MPPT200 [13.1]. It should be seriously looked into as an alternative to the Trace C12 since it also has a built in LVD and is competitively priced. Lead acid batteries still appear to be the most cost effective solution for most situations though one should take into account the cost of an environmentally sound way of disposing of worn out batteries when making comparisons. Again in legacy Telecom systems all the batteries are at the local switching center where they are kept in a controlled environment and monitored regularly. This makes it feasible to use ordinary flooded cell lead acid batteries with Catalytic recombiners. On the other hand a VoIP system requires many batteries in the field where there is little control over operating conditions. Also they often need to be transported and handled by less experienced people. 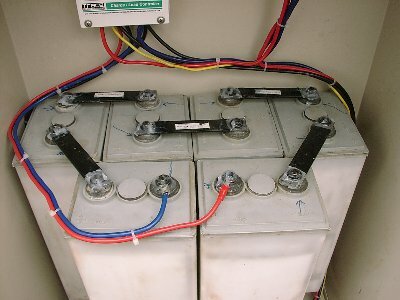 In this situation sealed lead acid batteries are the better choice even though they are more expensive. 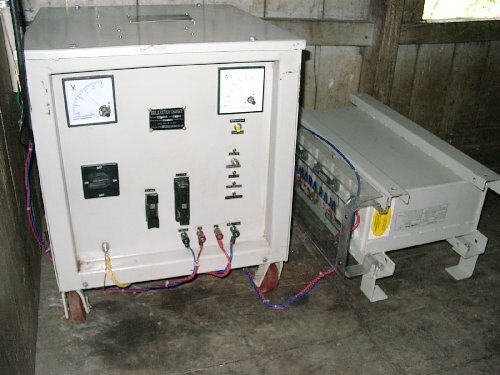 There are several types of sealed lead acid batteries, Valve Regulated (VRLA), and Gel-Cells are two examples. Gel-Cells won't spill if tipped over and can often be mounted in any position. 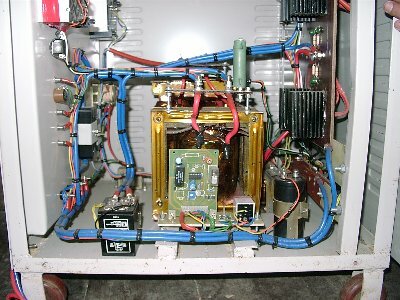 Proper venting is also important, especially for flooded cell lead acid batteries. There have been accounts of roofs being blown off by hydrogen explosions. In any case there will be a sizable investment in batteries for the system. Therefore one would want to maximize the lifetime of the batteries and minimize their maintenance requirements In order to lower the cost of ownership. This means extra care should be taken when choosing a charging / monitoring system. Again all things being equal it is desirable to buy locally but carefully research the quality of all products before making a choice. There is a wide spectrum of chargers available for lead acid batteries. Generally the higher end three stage chargers are required here, and ideally one with an integrated LVD. The LVD protects the battery(s) from being over discharged which would seriously damage them. In fact if a Lead Acid battery is only discharged to 80% of it's capacity then that will almost double its lifetime . Also it's interesting to note that it gets harder and harder to put energy back into a battery as it gets fuller and fuller. This is called it's charging efficiency, and it varies nonlinearly with the battery's state of charge (SOC) . The Consultant's hypothesis is as the battery is charged the chemical reactants are converted to the charged state. As the battery nears full charge less and less reactants are available for conversion, and the internal resistance of the battery goes up. In the end about half of the power going into charging the battery is wasted as heat. If this is not taken into account when designing solar systems the panels may be under sized and may not be able to keep the battery bank fully charged. Most likely this is not an issue here because of the aggressive recharging time that was required for these solar systems. There are several good papers on the appropriate design of battery systems for solar sites at Sandia Labs . As a bit of added insurance for the repeaters the Consultant felt that it wouldn't hurt to add a timer that would power cycle the unit once each day at four in the morning. Sometimes computer based devices (also known as embedded systems) can lock up for unknown reasons and then need to be rebooted. A timer is a low cost solution that can save one a trip into the field. If one had more control over the specification of the embedded systems then a watch dog timer is the preferable way to protect against these type of problems. Watch dog timers are built into a lot of modern microcontrollers. They act like a dead man switch and once activated they need to be "touched" by the software every half second or so or they cause the system to reboot. If properly implemented they add a good fail safe component to one's embedded system. For this project low cost digital timers were purchased from Amazon.com  and modified to work on 12V. 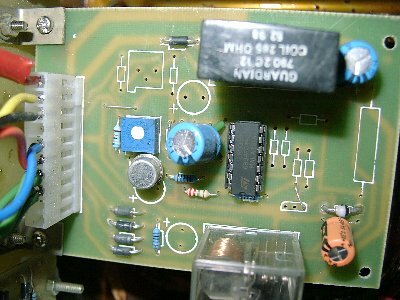 There are also ready made 12V digital timers but they seem to be quite a bit more expensive, probably because there is not as much demand . 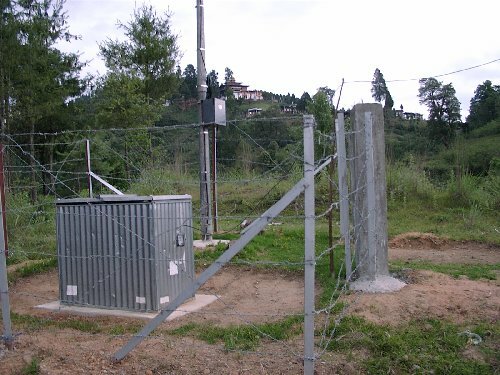 The repeater equipment needed to be protected from the elements and rather than shipping metal boxes from some faraway country a local supplier was sought for them. 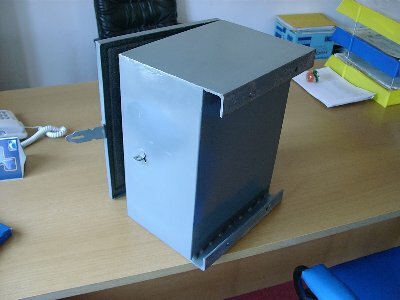 It turned out that one of BTs metal shops was able to make very nice weather tight boxes for about $20 each, compared to $40 from India, and $100 from the US. They even sported sharp hand painted logos! There were a few issues with mounting though because the Angle iron was upside down. See figure 9 b above. Certainly the next batch will come out just fine. There was a lot of concern over proper grounding and lightning protection, and for good reason. In Gelephu There are lightning storms several times a week in the summer. Sometimes At night it's as if someone were arc welding in the sky, and one can almost use that light to see by! The Bhutanese have a lot of experience with lightning protection because after all they live in the land of the thunder dragon. Generally they use lightning rods with spikes and heavy metal straps on the roofs running to deep earthing pits. These pits are usually about 3 meters deep with a plate of copper in the bottom to which the grounding strap or wire is bolted. The pit is filled with layers of salt and charcoal both of which are conductive and help to retain moisture. The top meter or so is filled back in with dirt. In very dry areas an additional measure which helps is to leave a pipe in the ground which ends near the top layer of salt and charcoal. A funnel can then be used to poor salt water back into the earthing pit . This will keep the ground moist and replenish the salt content which dissipates over time. There are also other chemicals that will increase the conductivity of ones ground and last longer than salt . At sites where only an equipment ground was needed copper stakes were used connected together by the grounding wire which then ran to the equipment. A earthing meter was used to measure the resulting ground to check if adequate. Even so with all this experience and good practices there are still many thousands of dollars damage caused by lightning each year. For the project's relatively small sites there was some discussion as to what the most cost effective earthing practice would be. What it boiled down to was that large voltage potential differences are to be avoided. Keep in mind the with even the best grounds the area surrounding a lightning strike will rise tens of thousands of volts for a few micro seconds. This includes all of ones equipment if lightning strikes the tower, it just can't be helped. But by itself a rise in potential doesn't cause damage. It's only if part of ones equipment is swinging to the tune of a different voltage that causes problems . Single point grounds are the best way to prevent this from happening. This will also avoid ground loops which are always undesirable in electrical systems. Simply put, a single point ground is where each ground stake and each piece of equipment including the lightning rod have separate runs of grounding wire to a common point, usually a terminal strip or bus bar. If that sounds too expensive there are some shortcuts one can take that don't appreciably diminish the protection provided. One should avoid at all costs inadvertently grounding different interconnected parts of a system to different grounding points. If there is a nearby lightning strike then most likely the different grounding points will develop high potential differences as the surge passes through them, and this will destroy the equipment. This is an example of how an improperly grounded site can actually cause the equipment to be damaged instead of protecting it. See figure 11 c.
It's the Consultants opinion that there is a situation where two grounds are acceptable, as long as there is no electrical path from one one ground system to the other. Thus keeping them separate so that even though they may be at different voltage potentials no current flows between them. Since lightning is so unpredictable guaranteeing that no current will flow is difficult. It would probably be unwise to have two separate grounds in the same building because the strike could jump from one system to the other. On the other hand it might be best to give two towers 50 or more meters apart separate grounds. In this case one would use separate grounds and carefully ground cables that came in from outside the local grounding system of each tower. Commercial power is a good example of cables entering from the outside. 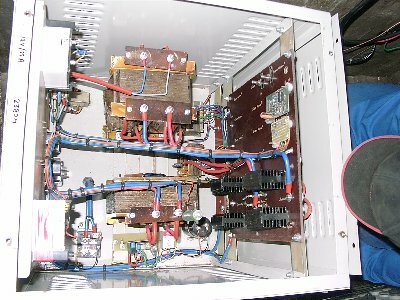 It's common to put large Metal Oxide Varistors (MOVs) across terminals in the panel to protect against surges and some strikes. For example there may be a microwave tower at a site but there are other antennas on it using the same band as the equipment. Then it may not be feasible to put one's radios on the same tower. 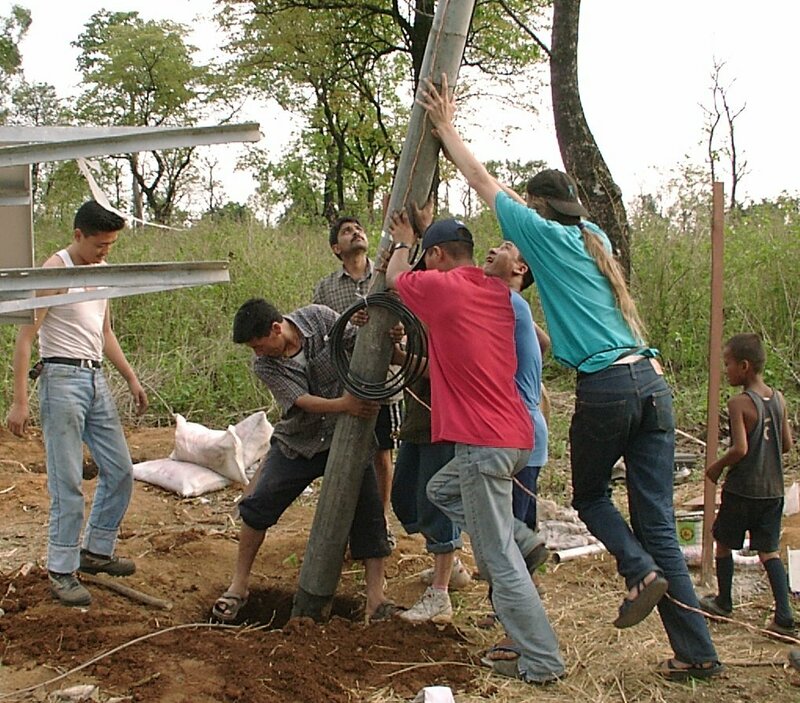 If one erects a smaller pole or tower a hundred meters away then it may not be practical to ground the two towers together. When grounding ones antenna or coax it is a good idea to have several loops of coax before it enters the equipment box or building. Because lightning causes such rapid surges even small inductances have very high impedances. This means lightning will tend to avoid going through coils and try to find a short straight path to earth. 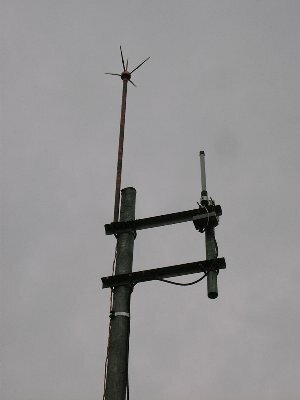 For the repeater sites that were not colocated on preexisting towers, lightning rods were installed at the top of the poles with the antenna about a meter below. Additionally it's advisable to run the grounding wire for the lightning rod down the opposite side of the pole from the coax giving it the best chance to survive a strike. providing single point grounds for solar repeater sites was easy. Sites with commercial power were harder because the power line was also grounded somewhere else. The neutral side of the power line isn't such a problem because it could go though ones local single point ground but the hot side could transmit any surge into the site. In the US the model for lightning induced surges on the power lines is a nanosecond rise time up to 6000 volts with a 20 microsecond decay. It would be best to use a lightning arrestor or surge suppressor on these lines when they enter the electrical "panel" for a site. Often lightning arrestors are of the gas discharge type, and these fire relatively slowly when compared to the rise time of a lightning strike which is on the order of nano seconds. TransZorbs are another common surge suppressor based on controlled avalanche diodes with sub nano second response times . 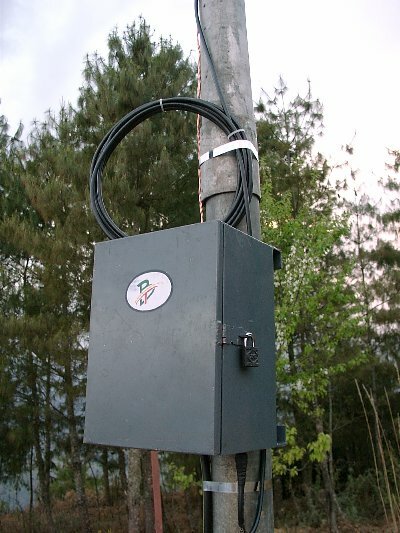 These are often useful in protecting equipment on phone lines from surges caused by nearby lightning strikes which are then inductively coupled into the lines. 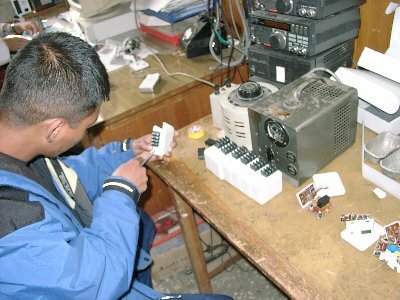 ONEAC is another manufacturer of high quality power conditioning equipment and surge suppressors . They also have a popular phone line suppressor . 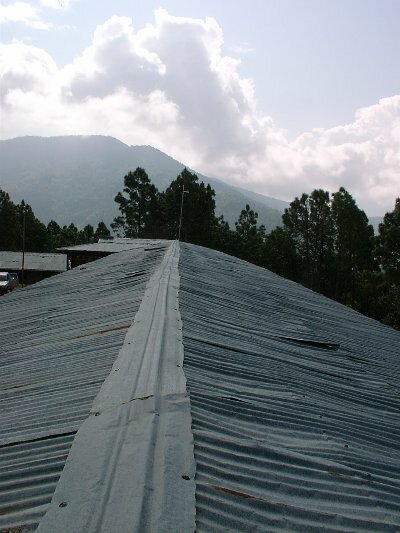 For most of the CPE sites lightning rods were not required because the metal roofs acted as a shield. The Yagi antennas were installed just under the eves pointing out toward the local repeater. It would be extremely unlikely that lightning would curl under the roof to find the antenna. 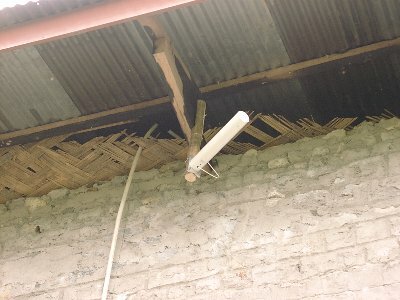 Most of these roofs didn't have lightning protection being village houses, but sometimes there were cables holding the roofs on that would also conduct a lightning strike to ground. 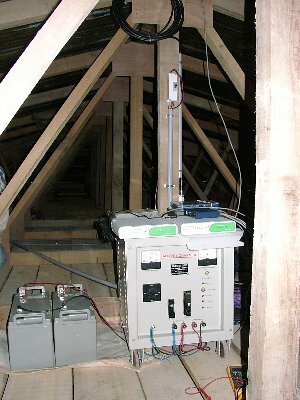 This is another example of a separated lightning and equipment grounding system. Last but not least preventing strikes in the first place should probably get the most attention. A lot of sharp spikes mounted on a tower will tend to pass the charge on the tower into the air and either neutralize the difference in potential or pass a lot of it off to the surroundings so the tower dose not stand out so much as a likely target. One product that does this is Stati-Cat . Something like the Cortana Static Kitty should work great on the repeater poles. Also note that it's advisable to put something like this along the top edge of solar panels so that they are not a target. This was done at the solar powered microwave stations such as the one at Limukha (figure 12), and the sharp spikes on the lightning rods also serve this function to some extent. Of course one could build these locally and probably do a good job with some attention to detail. Stainless steel is the best metal for the spikes. Don't use steel it will be useless after it rusts. Brass or bronze are also good second choices . One practice that the Consultant wasn't too keen on was to take fairly heavy gauge wire and unwind the strands into two pieces thus giving twice as much wire for grounding. 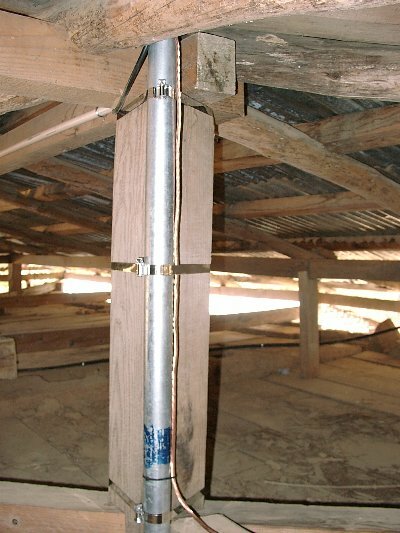 It seems that with all the expense to dig the pits and buy the copper rod grounding kits and such, that to cut costs on the actual grounding wire is not a good balance of resources. This smaller wire becomes one of the weakest links to ground, the very thing one is trying to improve. There are accounts of 1/2 inch copper pipes utterly evaporated and puddled. Others recommend double-O size wire to safely handle the current of a strike. 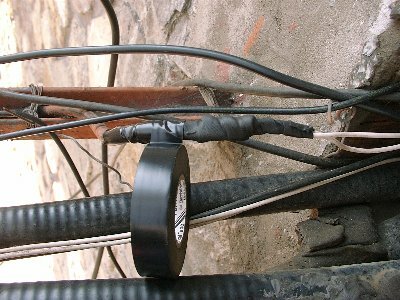 Even though crimping is an acceptable way of connecting wires and stakes it is still prone to corrosion and other problems. Especially if one uses dissimilar metals which should be avoided for this reason. A step up from crimping is the irreversible compression-type bond. The same metal is used for both the wire and the compression fitting, and the crimping pressure is high enough that the two are "welded" together. This type is UL467 [33.4] approved for underground burial. Burndy has a line of these connectors, please see the following references for details: [33.1], [33.2], [33.3]. Clamps are probably less reliable than crimps. Solder can't be used because it melts away at the first trickle. Unless done correctly braze welds may not create a proper bond. A another reliable method that may be warranted sometimes is exothermic bonding . This actually welds the wire and stakes together with a surface area that is greater than the cross section of the wire. Cadweld® is a well known exothermic bonding product . There is also a manufacturer of a exothermic bonding product in Bangkok . 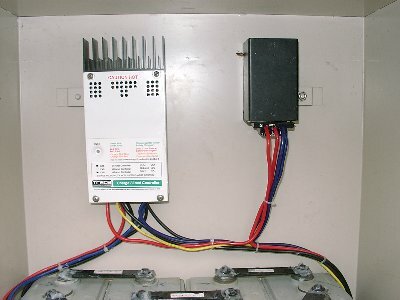 Try to find better surge protection for the phone lines where they connect to the residential gateways. Possibly the TransZorbs , or the ONEAC OnLine product  will work. Ethernet cables that run from the inside of a building to a tower need to be treated as two cables connected and grounded at the point of entry to the building. Often these are Unshielded Twisted pair (UTP) and require a special grounding kit. This supports the single point ground practice and ensures that the the power and data cables will swing in potential together at the end where the data radio (repeater) is. A little more care is required when planing how items will be shipped in developing nations. There were a lot of problems with the DHL shipments, and the VocalTec shipment came in on a truck from Phuntsholing with very little protection from the elements. 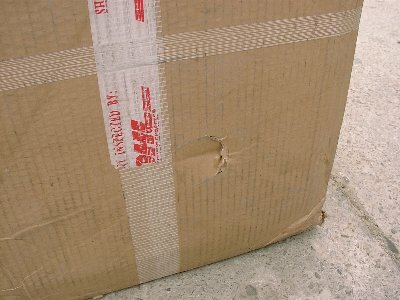 Though the crated shipment from India seemed fine (figure 13 a) and of course the repeater boxes which were made in Bhutan are pretty indestructible (figure 13 b). There were a lot of logistical issues involved shipping hardware from the US. 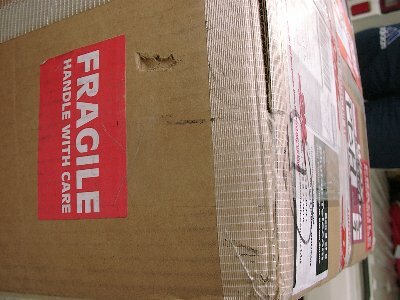 First and foremost it's very costly to ship hundreds of kilos worth of equipment halfway around the word. Then there is something called volumetric weight charges which means a box will be charged not only according to it's actual weight but also to it's size. 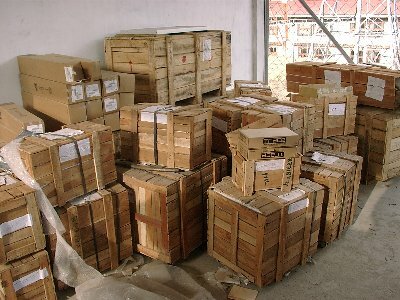 If one merely ordered components from many vendors and had them shipped to them it would cost much more than if first they were consolidated into larger boxes. So that is what was done here. This means that most of the original packaging had to be thrown away and each item had to be repacked carefully in the larger boxes with just enough cushioning between items to protect them. The large boxes were carefully constructed as well. They actually consisted of an outside and inside box separated by 3/4 inch structural Styrofoam sheets. This provided uniform protection from impacts to the items packed against the sides of the inside box. As can be seen in figure 14 there were some reasonably deep punctures to the outside box. Though nothing was damaged. All in all this packaging scheme worked well and saved about five thousand dollars USD in shipping charges. Next it was hard to get a definitive answer from DHL as to how long it would take. They assured us that the shipment would arrive within a week but actually it was over two before it arrived. The details of these delays are probably beyond the scope of this report, but suffice it to say that if DHL didn't have a monopoly in Bhutan then these issues would probably resolve themselves. 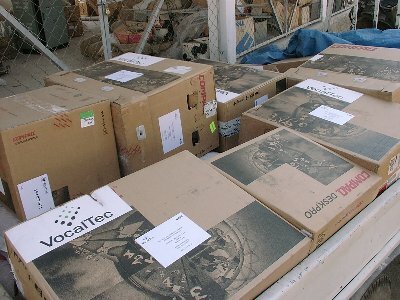 The VocalTec gear arrived from Phuntsholing on the back of a truck. Like most roads it is likely to be fairly dusty, and the computers inside the boxes seen in figure 15 are are not protected by plastic bags or the like. The cause is uncertain but the hard drives in one of the servers failed a month or two after install. One may have to accept that computer components and especially drives will have a lower Mean Time Between Failure (MTBF) under these conditions. First the timers were converted to 12V. The procedure varies somewhat depending on the timers but one can save some money and build up capacity for local repair of the repeaters. However the timers were just an interim solution intended only for the pilot project. As described above, a watchdog timer would be the preferred solution. Please see figure 16 above. Next the radios were converted to use N connectors instead of the nonstandard R-TNCs that they came with. See the Radio Training Manual  for details. Then a mounting shelf was made out of wood and the parts were installed. Will this location serve a good number of customers? Or can several repeaters and CPEs link to this location? Is there LOS to the repeater for this area? Is the commercial power reliable enough to keep the batteries charged or should it be a solar site? 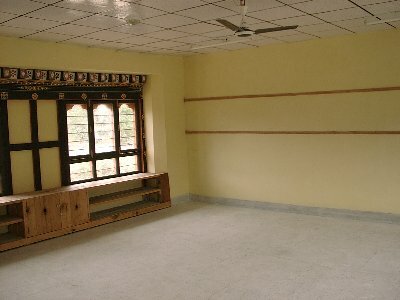 Can arrangements be made with the owners to install the equipment here? Most installations went smoothly. Sometimes the appropriate fasteners were not available so alternatives were used. Please see Appendix 3 for site pictures. 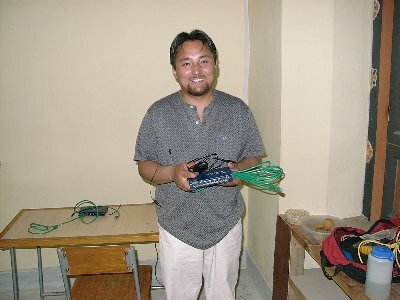 Initially the intention was to have two Flytech routers in the NOC connected to different subnets in Limukha and Gelephu. However when the VocalTec servers were set up it didn't seem to be possible to enter anything but a default route in their routing tables because they were Microsoft boxes. Later it was learned that some versions of MS OSs are capable of using full routing tables but there was some doubt expressed that they could do it correctly. So the VocalTec gear was set up to point at the Gelephu box for its default routes, and the Gelephu box pointed to the Limukha box for that subnet. This seemed work fine and attention was focused on making adjustments to the radio network. Also the VocalTec monitoring software was a little too sensitive to dropped packets and variations in timing on the radio network. They eventually had to update their residential gateway firmware and monitoring software to relax their alarm conditions a bit. Because all three of these systems were interdependent and tightly coupled it was very hard to track down problems. In cases like this the best plan of attack is to solve the obvious ones first and then do experiments to isolate the unobvious ones. At one point the Consultant suggested that it would be cleaner to have the packets destined for the Limukha network to go through a separate cable connecting the two routers, rather than having them bounce back out to the switch again. At that time it was thought that there were still radio interference problems that needed to be solved so this wasn't tried. Later the switch configuration was changed to solve a minor problem in the NOC. The Consultant also noticed subtle oddities with the switch under certain conditions but dismissed it as some "feature" that he wasn't aware of. Many people looked at this problem, and several TCP dumps were gone over carefully. The VocalTec engineers noticed some oddities there, but apparently nothing concrete. There were no ICMP redirects or anything else that might indicate a configuration problem. There was the occasional CPE radio that would disappear for a bit and one would see the "No route to host" error. So for the time being work continued on the radio network. Eventually a pattern began to emerge after other changes to the system became less frequent. The calls to the PSTN side from Gelephu always went through but occasionally similar calls from Limukha mysteriously failed. The Consultant then suggested that the default routes be changed to point at the Limukha box and the routing tables in both Flytechs be updated accordingly. There were some other experiments in progress at the time so it couldn't be tried immediately, but when it was, the problem area switched also which indicated that it was a problem at the NOC and not in the radio network. The Project Manager then suggested that one router should be used instead of two as can be seen in figure 18. This seemed like a good idea, the trade off being there would be (another) single point of failure but that there would also be a spare router. So an E1 card was installed in the Gelephu Flytech which was connected to Limukha and things started working much better. At the time the Consultant returned home there was still a problem placing long distance calls which was eventually solved by another firmware update to the PSTN gateway. It should be noted that the trouble shooting of the VocalTec system was hampered somewhat by not being able to make test calls without disturbing customers. Or conversely needing to monitor the system for a day or so to wait for a pattern to develop with the customer generated traffic. The Cisco radios use Spanning Tree Protocol (STP) to act as network bridges. This will work even if the SSIDS are different if they have a wired connection to each other. They also will allow one to enter routes and act like routers but the Consultant had difficulty making this feature work. This was one of several occasions where the Cisco product didn't perform as documented, however if used in the most common configurations it worked flawlessly. The lesson learned here seemed to be, let bridges be bridges and routers be routers. Instead of giving each repeater a address in it's own subnet and making that the default gateway for it's CPEs, all repeaters in a site were given IP addresses in one subnet which included an interface on the Linux router. This became their default route. Next, virtual interfaces were added for each default route that the CPEs needed, being in different subnets as they were. Since the Cisco radios would bridge these subnets back to the Linux router, as far as the CPEs were concerned they had a local router for each of their subnets. One small advantage of this was that one could experiment with other radios that behaved as routers instead of bridges without changing the CPEs configurations. Of course bridging is a nice feature, it allows many sub-sites to appear as one seamless network, and probably would be a good choice for other projects. Having different subnets for each repeater was mostly an arbitrary way of organizing the project as much as anything else. For a nice intro to Routing see [5.3], and Bridging see [5.4]. The microwave towers that some of the repeaters were on had a preexisting service known as Digital Radio Multiple Access Subscriber System (DRMASS), which was also in the 2.4 GHz band. The channel used by DRMASS was below the ones available to the 802.11b radios, but close enough that mutual interference was an issue. These problems manifested themselves differently at each site. At Limukha initially there was noise on the DRMASS voice circuits, and the backbone link would go down periodically. 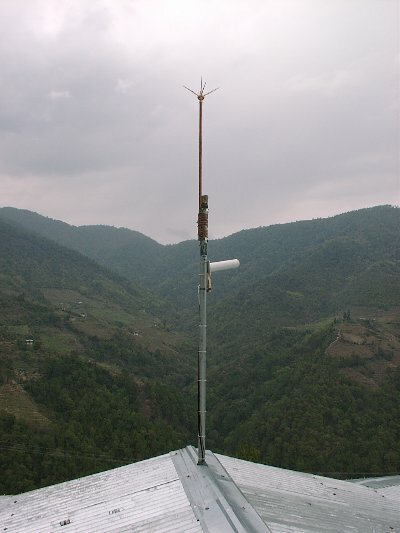 In Gelephu DRMASS didn't seem to be affected but one of the three 802.11b radios was slightly less sensitive. This usually was the radio on the channel nearest the DRMASS frequency. Various steps were taken to correct the problem at Limukha. First the backbone dishes were changed from vertically polarized to horizontally polarized and different channels were tried. At one point intermod was suspected at one site because the only frequency that would work was the center one available to the 802.11b radios. Note that 802.11b is a compromise between a narrow band signal and full spread spectrum, also known as wide band. The DRMASS channels are even narrower. This indicates that intermod might be possible between them. It was inconvenient and difficult to make trips to the repeater sites but eventually the test for intermod was made and this proved not to be the case. Another related common problem is that the amplifier distorts the signal when over driven, and the distortion can interfere with adjacent channels. Another common problem that can affect closely spaced antennas is side lobe radiation. The radiation pattern does not steadily drop off at the the edge of the usable area, but has smaller lobes at the edges. If antennas are spaced too close together, or are transmitting at a relatively high power then it's possible for the side lobes from one to radiate into another and desensitize it to it's intended signal. For these reasons it's much better to run one's equipment at the lowest power setting that still allows for some rain fade. 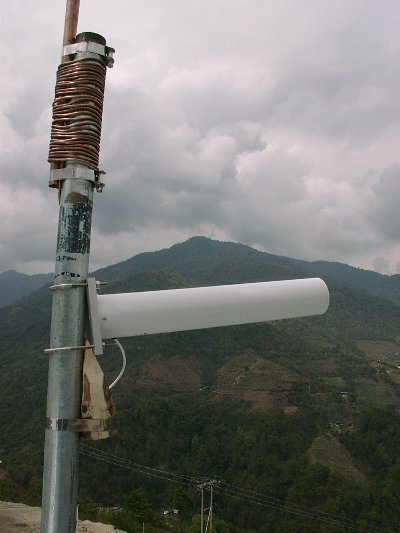 A large portion of the interference to the 802.11b radios at the Limukha hill top were caused by the other 802.11b radio. The Consultant had recommended moving the backbone dish halfway down the tower to help correct this mutual interference and to protect it more from lightning strikes. Eventually it was possible to make another trip to Limukha to do so. At the same time it was also desirable to move the omni antenna to get it a little farther away from the lightning rod though it was in relatively the same placement as the repeaters which were mounted on telephone poles. This proved difficult because it had to be near the top of the tower to hit all the CPEs and the Talo repeater, and the other possibilities put it very close to the DRMASS antennas which caused them unacceptable levels of interference. So the 802.11b omni had to be left where it was. The Talo repeater which provided service to some CPEs that couldn't see Limukha directly seemed to be having problems making itself heard. This was probably because the Limukha omni was in a somewhat noisy environment. So next the omni was moved onto another pole mounted a short distance away from the tower but it didn't seem to help much, and it might have even increased the interference between the 802.11b radios. Then Talo was upgraded to two radios with one using a dish antenna to talk back to Limukha. This did seem to help. Because the Talo link has since become intermittent the Consultant recommends moving the omni back onto the tower. Additionally it might be possible to lower the DRMASS antennas a bit to lessen the side lobe interference between them and the omni. In Gelephu the DRMASS seemed to cause relatively minor interference. The Consultant did some signal measurements for the omni by walking a path around the tower about two city blocks square. When the omni was assigned the lowest channel the noise level was higher at most points along the path. Another oddity which may have had nothing to do with DRMASS was that once or twice a day one of the outlying repeaters would switch parents from a dish to the omni. Sometimes this would happen at four in the morning when the timer turned off the radio for one minute which is understandable. If it turns out that this area can be covered adequately by the omni antenna then it would probably help to have less radios on the tower. When dealing with neighboring radio services it helps to have extra non-overlapping channels to give each some elbow room. 802.11b is part of the ISM band and different countries have chosen to allocate it different numbers of channels within this band. The Radios used in this project were from the US and only have eleven channels available to them out of a total of fourteen [20.1]. If it were possible to get radios with all fourteen enabled then perhaps coexisting with DRMASS or other 2.4GHz systems would be easier. Here is a tutorial about different strategies for channel allocation . Because the Cisco Bridges were monitorable by SNMP the Cricket router monitoring and graphing package was used to monitor them [5.8]. The Bridges provided two useful types of data, Throughput, and RF link data. For example, in figure 19 one can see graphs for the bandwidth used on the "backbone" link over a twentyfour hour period. First one notices that the throughput is asymmetrical. This could be caused by one person doing most of the talking on some of the calls. Second that the outgoing in "a" (blue) matches the incoming (green) in "b" which is as it should be. Also if one knows the data rate for the default Codec then the number of simultaneous calls at a given time can be estimated. As the bandwidth usage increases so do the RF errors. As mentioned earlier this is somewhat pronounced because the link is simplex. There would still be a small increase in the error rate on a full duplex link but it would be proportional to the throughput in one direction only and not dependent on how much data was being sent back. In figure 20 a one can see that the retires roughly match the receive errors in 20 b. This is typical for a point to point link. Also the red graph in 20 b (Holdoffs) indicates that the Limukha dish is in a bit of a noisy environment. Holdoff Timeouts are where the radio has waited an unreasonable amount of time for a clear space to transmit a packet. They are also graphed in red but would fill in the area under the graph like the green retires graph. Since this was never seen it means there were no Holdoff Timeouts. This shows that the interference from DRMASS was not severe. Figure 20 c shows similar errors for the Limukha omni. It is noticeably different from the other two probably because it is talking on a different frequency and to several CPEs and a repeater. This hints at the limitation of this type of monitoring when several factors are aggregated into one graph. It would be much more helpful to monitor each CPE and look at their error rates because they tend to link back to only one repeater, and as seen in figure 19 each end of a link has virtually a mirror image of the other's information. Unfortunately the Avaya ECs were not SNMP capable. However the Soekris SBC are, and it will be interesting to see how much this information helps in trouble shooting. Another complementary type of monitoring is to watch the services provided by the system and alert if any fail. Some examples of packages that do this type of monitoring are Big Brother, Big Sister, Netsaint, and Nagios [5.10] - [5.13]. Most of this was done while the Consultant was finishing up work in Gelephu. Please see the Project Manager's report for details in this area. At the request of the Consultant an e-tel GW210, two Symbol NetVision phones and, a four port GW built from an old computer were purchased and demonstrated to work with a free Linux based H323 software. Even though this very low cost system performed fundamentally the same functions as the Commercial vendors system it was obviously not ready to be deployed in the field without further development. The Consultant feels that in six months to a year such a system could give commercial vendors like VocalTec a run for their money. A lot of this software can be found on the Open H323 site [5.5]. The Consultant also brought a Single Board Computer (SBC) and some wireless cards to experiment with. After quite a lot of development He was able to demonstrate a diskless wireless router with these main features. There were also other features which could have been selected like fire walling. Because the Thinlaygang school area was one of the sites with two VocalTec GWs which could not be supported by the ECs, and it was a high profile site with a brand new school, the Consultant proposed that the SBC be installed there in the hope that eventually Internet access could also be provided to the school and community. The installation happened very near the end of the Consultants stay but went fairly well. The system worked for a couple of weeks and then developed a problem, which was sad but the simplest thing to do since the Consultant had left was to put back the EC. It would be worthwhile to take more time to burn in a unit and it's firmware for a while before making another attempt. Two trainings were conducted in June, one for the radio equipment and the other for the Flytech routers. The material covered was from the Radio Training Manual , with a question and answer session. There were several requests for additional training. Mostly from the Technicians who will be responsible for maintaining the network. The Consultant made himself available for other hands on training sessions but everyone was busy finishing up the project so unfortunately that never happened. There were two sessions, one covering the basics from the Flytech Training Manual . The advanced session covered routing concepts but frankly there was not enough time to do it justice. More training will be needed in this area. More experience with setting up different configurations of radios, and trouble shooting is needed. This would involve learning about the different menus/tools available to test and monitor the network. The Technicians need a deeper understanding of IP addressing, and how to put subnets together and add static routes for them. Because the Cisco radios do bridging well but apparently do less well at routing, the network is an 'interesting' combination of bridging and routing. If the network configuration becomes broken during an upgrade then they would most likely be the ones to drive to the remote sites and fix it using a laptop and serial cable. They would be more prepared to handle these tasks if they had a better understanding of networking. Last but not least they need more experience with the Unix command line environment. There are several reasons for this. Windows has been found to not always be a reliable platform to trouble shoot from so the laptops tend to be set up to also boot Linux. Most of the useful tools that are used for trouble shooting are Unix/Linux based for similar reasons. Several of the routers in use are Unix/Linux based and to set them up properly one needs to know the local editor and command line syntax. Also the knowledge in this area would come in handy when coordinating work with Druknet (if that's needed) since Druknet has several Unix based servers. Other routers like Cisco's have environments that were derived from Unix systems so that knowledge should transfer easily to these platforms as well. To adequately provide enough capacity for VoIP and higher bandwidth services higher speed backbones need to be researched and tested in the field. A cost tradeoff study should be conducted comparing half and full duplex equipment in the speed ranges of 50. 100. and 150 Mbps. The cost of the repeaters could probably be reduced as well as their power consumption. This would especially help the solar sites be more cost effective. More R&D needs to be done on repeaters and CPEs using low cost SBCs. One immediate cost reduction for the CPEs is to use the Poynting Yagi antenna [5.2] which is about a quarter of the cost of the Hyperlink. It would be nice to find a smaller commercial power battery charger as well. For the solar CPEs try out the BZ products MPPT charge controller[13.1]. Move the Limukha omni back to the top of the tower. 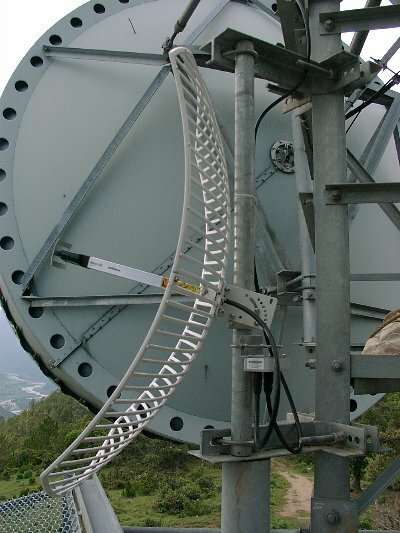 Remove one of the Dish repeaters on the Gelephu tower and set the remaining repeaters to non-overlapping channels that are at the top end of the range. This will minimize the interference between the 802.11b radios and DRMASS. New CPE equipment should be designed which is SNMP capable so that RF link status can be easily monitored so problems can be more quickly isolated. Complementary monitoring packages should be installed to keep tabs on the state of the network, such as NetSaint [5.12], or Big Sister [5.11]. VocalTec has worked hard to make their equipment reliable in the wireless environment and it seems to perform at the level one would expect in a commercial setting. 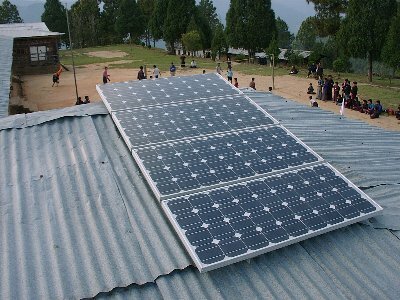 However there are areas in Bhutan and other developing nations where the high cost of such a system would not be viable. Perhaps a VoIP system based on free software is worth looking into. 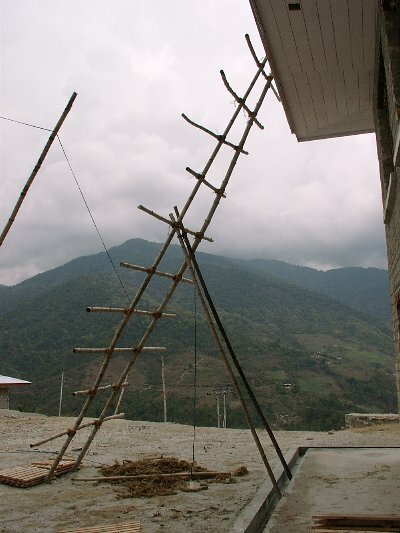 For example the Sherubtse college area in Eastern Bhutan might benefit from such a system. Some other projects in this vein are the Jhai Remote IT Village Project . Since there is already a lot of software development being done in Bhutan for the government, perhaps an in country billing system could be developed using Druknet's as a model. When choosing software or hardware/firmware packages for a system keep in mind these general guidelines. The system should be built around open standards. Ideally this allows many to contribute to a standard and puts manufacturers on equal footing when building products based on it. Thus there will tend to be more product choices. De facto standards are less desirable because fewer companies were involved in setting them. Check for interoperability between different vendors. This shows that the standard is being followed faithfully, and gives one many more options when looking for solutions. Many things contribute to overall system reliability: Redundancy, such as RAID arrays, multiple network connections, multiple servers, to name a few. Graceful fail over to other redundant components when one fails. Early warning of problems that might predict a failure, and just good system design. All of these are desirable. When making comparisons it's useful to evaluate the Total Cost of Ownership (TCO). For example one would tally up the expected cost of customer support, replacement hardware, software upgrades, hardware upgrades, maintenance personal, etc. Ease of setup usually means one needs less support, less time, and that the configuration process is less error prone. If the system is continually growing then this is an ongoing issue. Ease of administration will be a large factor in TCO. The cost of maintenance depends on the rate of failures, cost of the replacement hardware, number of people it takes to do the work, etc. Allows Simple Network Management Protocol (SNMP) monitoring of all units. A good monitoring system will filter and present the relevant problems. All events should be logged and searchable. There are many general purpose monitoring systems based on SNMP. Also simple reachability tests using ping are good way to monitor general system health. Check out refs. [5.9] - [5.13]. Allows logging of notable events to a central logging server. The firmware should be easily remotely upgradeable. Beyond this it's desirable to have a firmware and configuration management system to make it less time consuming to track and update many CPEs at once. This all adds up to low TCO. Having Link level or end to end encryption of data is nice for privacies sake. It's important for all Wireless (and most wired) devices to allow for the collection of statistics via Simple Network Management Protocol (SNMP). The items below should all be accessible this way. Signal strength / Signal to Noise Ratio (SNR), Retries, Holdoffs, Receive errors. Over time these stats will tell one if there is a LOS path problem, interference from other sources, or simply the useful capacity of this link. This will help track where the bandwidth is being used. Gives an indication of how well a unit is keeping up with it's tasks. FTP: Being able to transfer data into or out of a device is a great diagnostic tool. Because there are many CPEs which the customers have physical access to it's best to have a cryptographically strong security system with unique keys for each CPE. Each Device in the VoIP network should be able to authenticate itself using these keys. IP or MAC addresses can't be considered as forms of authentication. Since the network is wireless the traffic can be easily monitored with software readily available on the Internet. So it's advisable for each call to be encrypted. This uses only a minimal amount of additional processing power. Call Data Records should be in a form easily usable by many third party billing systems. Often a vendor will list the third party products that they interoperate with. This is probably not as important for a small system but it can be useful if one has several choices for routing either within the system or to multiple long distance carriers. The billing system should probably be considered separately from the VoIP system. They come in many shapes and sizes, find one that fits the project's needs. Again check what third party vendors a package will work with. The Gatekeeper or network monitor should collect useful statistics on system usage and state. An operator console should be available to keep an eye on things and make simple changes as needed. Some realtime and logged information on how calls are routed can be useful for growth planning and troubleshooting. There should be a way to call "test numbers" on any unit, in fact probably an arbitrary number of simultaneous test calls should be possible on a GW (CPE or otherwise). In addition to this, one should be able to specify several parameters of the test call: Codec, audio file to play, (ie. test tone), or echo audio data back, etc. The idea here is to have a GW automatically answer a test call without ringing a customer's phone. If it reports, or logs statistics for these test calls that's a plus. As mentioned above SNMP retrieval of stats is highlydesirable. Again, being able to send and receive arbitrary data to a network device is very handy for simple throughput testing. Of course it's a convenient way to update the units firmware and configuration also. 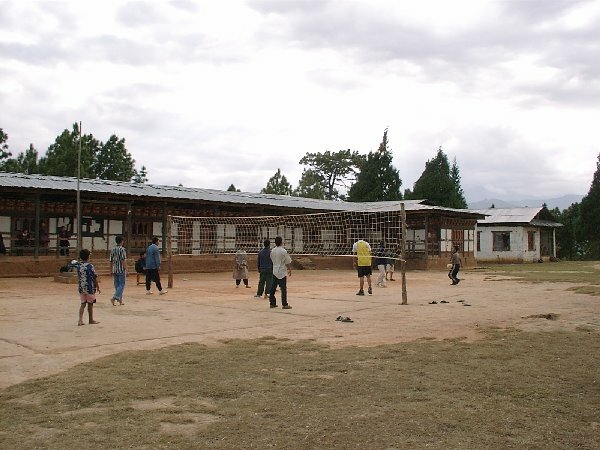 Thinlaygang Middle Secondary School should be set up with Internet access using the next revision of the Soekris SBC. Other schools and communities should be selected for ICT center pilot studies so that students and the public can benefit from new technologies. A lot of schools and communities don't have power and won't be getting it in the foreseeable future. Solutions need to be found for these situations as well. 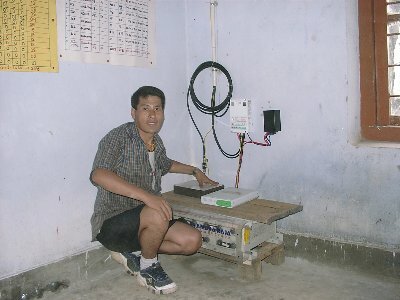 Very low power computers can be used and run from small solar installations. Probably the current solar CPE sites could support part time laptop use without adding panels. An inexpensive laptop should be setup at Limukha school to explore this possibility. As in the Jhai project , the hard drive should probably be replaced with a compact flash card. Of course appropriate security measures should be taken. Since lightning is extracting its toll on the Gelephu CPEs the use of TransZorbs or the ONEAC OnLine products should be explored there. On some high profile sites with lightning rods perhaps try out the Cortana Stati kitty . Consider using a irreversible compression-type bonding system for grounding. Explore the technique of using an epoxy holding compound as a better alternative to expansion bolts. This would allow the use of simple all-thread cut to length on site, and also usable as u-bolts. 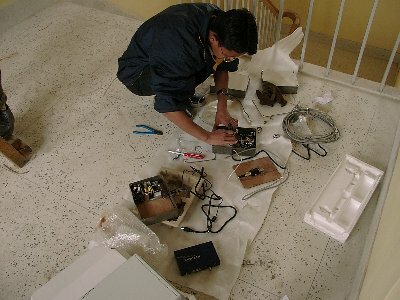 It seems to help technology transfer and skill building to look for practical things to construct in house. The timer conversion and weather tight box are two good examples. Perhaps the LVD circuit [A.1] would also make a good local project. It seems that a couple of improvements to how things are transported would help. The Consultant noticed that items would occasionally fall off the truck as it rumbled down the road. Even though an effort was made to tie the load securely there were often lots of small parcels that could slip out. A cargo net would help a lot here, and they are quick and easy to tie down. If cargo nets were not readily available then it would make a great cottage industry. They would be very easy to make at home using a simple board with pegs as a jig. Sometimes telephone poles and GI pipes need to be transported and they are also a little difficult to tie down on the back of a truck. A roof rack with a support near the tail gate would be very handy for tying these down. These could also be made in Bhutan in a simple welding shop. Some further research should be done using Open H323 and related software to build a viable low cost VoIP system. Also more systems should be developed using SBCs and high power PCMCIA cards. This would eventually yield a lower cost more robust system. This project was successfully deployed and commissioned, and should be tested further by providing Internet access to some schools and communities. Much has been learned and a new generation of equipment is already in the design stages which will correct most of the known shortcomings of the current generation. Most notably the issues being addressed are scalability, configuration management, better monitoring capabilities, lower power consumption, and high speed backbones. This will all add up to a lower Total Cost of Ownership or TCO. Below are some remarks by the Consultant's local counterpart(s) summarizing the system's evaluation. 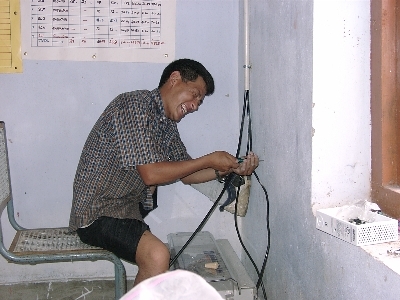 The suitability of the technology for the provision of rural access? This combination of VOIP and wireless is ideal for sparse distributed population.in terms of scalability, easy faster rollout, installation, reasonable power consumption and ability to provide data though we haven't tested that one extensively as yet, concentrating more now on provision of voice. Can the equipment meet the requirements of BT as well as the DIT? Basically capable. We have used Internet and checked mail using wireless cards on our laptops. What we haven't checked is effect of heavy Internet (data) use on the voice conversations taking place simultaneously and how we should dimension the system for simultaneous voice and data communication. I assume the cost per line is going to increase once we provide data access. Reliability of the equipment available? Except for the Customer premise gateways, which are sensitive to lightening the other equipment so far seem reliable. A new customer gateway has been developed and we will be installing it in the first week of November. Hopefully this will get rid of the lightening problem. 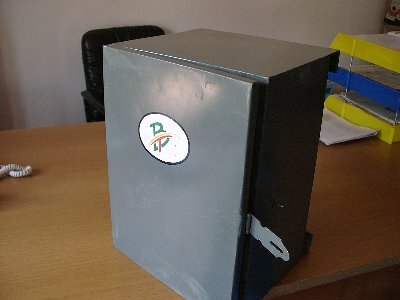 Power consumption and reliability of the power supplies as Solar power supplies will have to be employed at most sites? 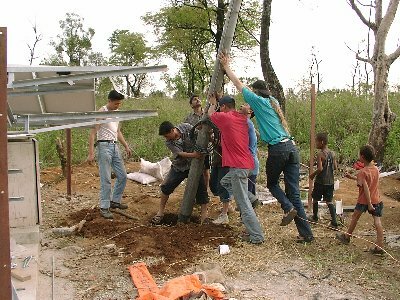 At present , in the rural areas solar supplied power is more reliable than the commercial supply. Flexible and capable. Easily scalable and flexible enough to introduce new services or changes if we want to, mainly due to the vendor being supportive. Installation and testing methods. Ease of installation and testing? Installation is simple, quick and easy. The only time consuming thing is the grounding of equipment. Obtaining a suitably low earth value is an expensive and tiring process. We haven't devised any guidelines or values for testing equipment. Mainly we have been doing that by making phone calls and listening to the quality. Reaction of people using this system as compared to using the traditional systems? So far we have observed no reactions. The people are unaware of the technology used and the quality is comparable to fixed lines except for very slight quality issues. The Consultant was dissatisfied with the quality of LVD devices locally available to some developing nations and felt the the high quality ones were too costly. After some research a couple of articles were found with schematics of LVDs. These seemed to be too complex, or at least more so than they really needed to be. Home power magazine published two articles with LVD schematics, one was also a solar charger and can be found at: http://www.solorb.com/elect/solarcirc/ccntlvd/ The other which seems to be just the LVD part without the solar charger is here: http://www.homepower.com/files/lvdhp60.pdf. 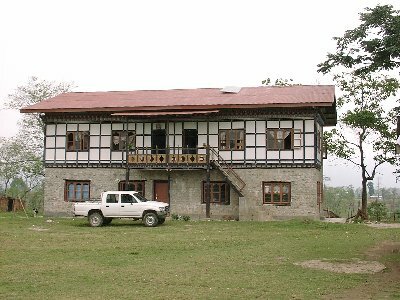 The page describing this circuit can be found here: http://www.bhutan-notes.com/clif/LVD_circuit.html. To be fair the hysteresis is fixed so adjusting the off point changes the on point but one could use a variable resistor instead of the 10M ohm one if that was important. It's also worth considering that one probably wants all devices set to the same standard and not readjusted in the field. This is why commercial LVDs are often preset at the factory and not user adjustable. There are some new techniques for charging batteries that can extend their life many times what was expected. Here is an excerpt from an article by the National Renewable Energy Laboratory. The current interrupt charging algorithm is a simple approach for recharging lead-acid batteries that extends the cycle life of the batteries by 300 to 400 percent. Lead-acid batteries used in electric vehicles have, until now, lasted only about 150 to 200 deep discharge cycles, primarily because the batteries have been charged using a constant current and voltage. In contrast, NREL and its partners, Recombination Technologies and Optima Batteries, devised a new and more efficient way to charge batteries. Their method involves applying a current to the battery for five seconds to overcharge the battery slightly, then interrupting the current for five seconds. This allows the battery to cool and avoid going into the oxygen recombination cycle, which leads to early failure of the negative battery plate due to oxidation of sulfuric acid into sulfate. "Our idea was to increase the cycle life of lead acid batteries to have less waste in our landfills," said Mechanical Design Engineer Matt Keyser. "By increasing the cycle life, consumers will use fewer batteries over time." Visit NREL online at www.nrel.gov. Here is a more detailed article on these new charging algorithms [7.1]. Sulfation is what happens to a lead acid battery if it is not fully charged, and equalized every few weeks or so. Many batteries have their lifetimes severely shortened by sulfation. 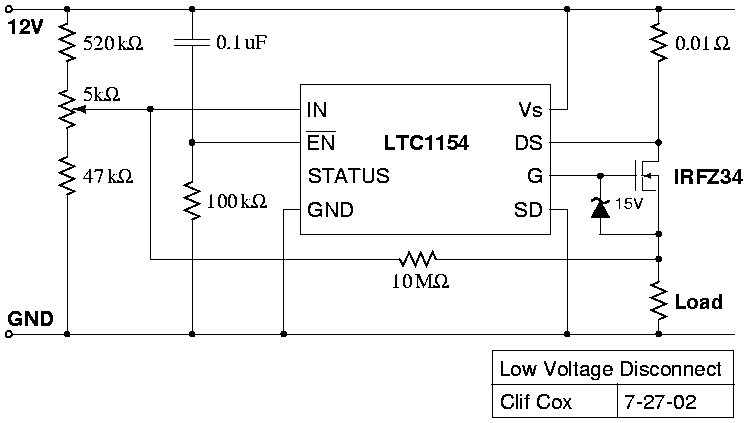 Here is a Circuit for reversing the process: . 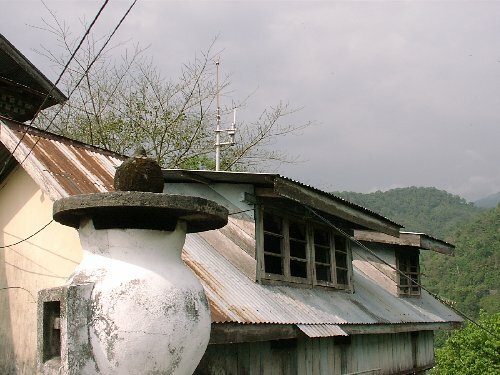 Talo was our first standalone repeater site, and is located in the Limukha area. The land was donated by a kind hearted farmer. Ai Bridge is another site with Commercial power in the Gelephu area. 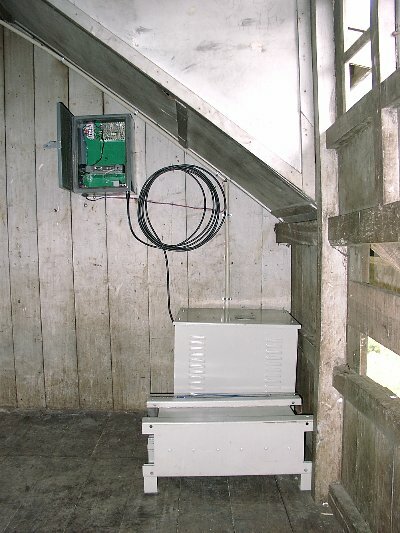 Chusegang is an example of a solar powered repeater site. It is near Gelephu in the hot and humid low lands of Bhutan. Four earthing pits were dug, which copper plates were then placed in with a loop of wire connecting them that also ran to the lightning rod. The pits were filled with alternating layers of salt and charcoal. 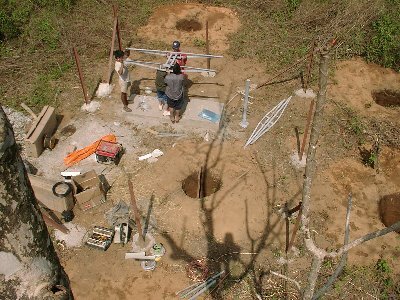 Concrete footings were pored for the repeater pole and fence posts. 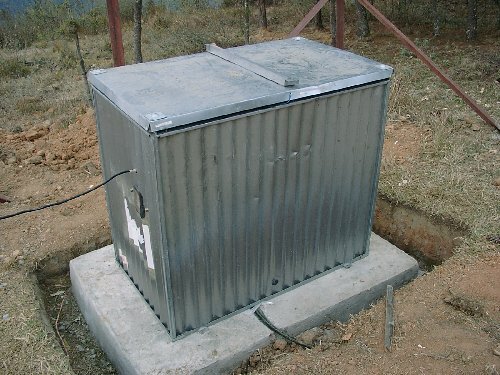 The grounding for the solar sites were very simple. 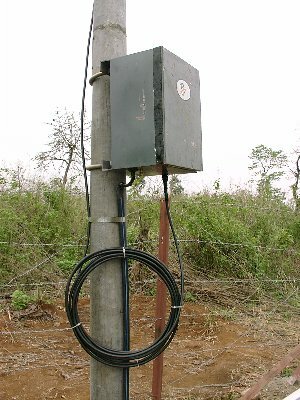 The solar and repeater equipment grounds were connected to the lightning rod wire at ground level. The Solar equipment was housed in a nice weather proof box recycled from another project. The Amara Raja Power Stack battery bank had to be taken apart and reassembled without its supporting frame for it to fit. The front cells hung over the edge of the metal platform a bit, later that was fixed with a block of wood. There should probably be a fuse between the batteries and the charger, oops! Fig. A.3.4.3 Some of the families served in this community are quite large! Originally the backbone dish was mounted at the top of the tower with the omni as seen in figure A.3.5.1 b. Later it was moved to the center of the tower as shown in figure A3.5.2 to solve some interference problems between it and the omni and also the DRMASS system. Fig. A3.5.2 Then the dish was moved down to provide more separation between it and the omni. Figure A.3.5.3 a shows the 802.11b dish in the center of the tower dwarfed by the giant microwave dishes. 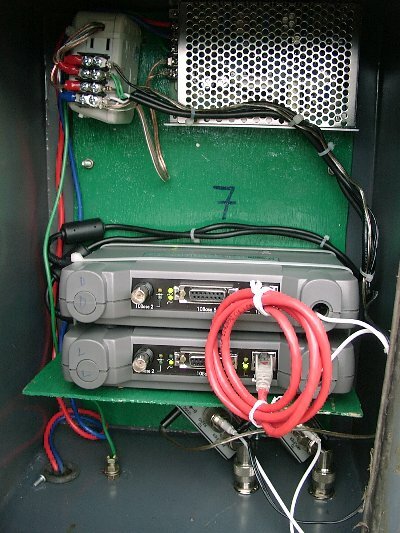 Figure b shows the inside of the repeater box with the red crossover cable connecting the two Cisco bridges. 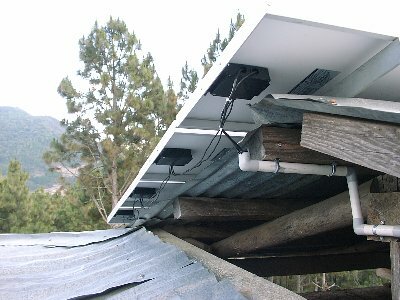 The top one links back to Dochula and the bottom one provides service via the omni to the Limukha area. 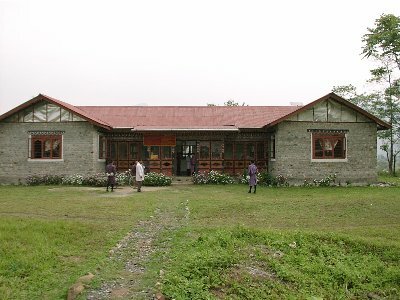 Limukha School is just a short drive from the Repeater tower, almost at the same elevation. The windy mountain road that descends to the valley below is impassable by vehicle for months at a time during the monsoon season. Good communications is a welcome improvement for this community. 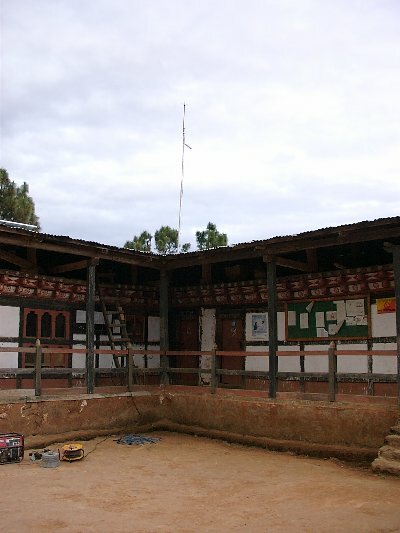 Thinlaygang school was not even quite finished when the team arrived to install the VoIP equipment. Initially the power was off more than it was on and there were some problems keeping the batteries charged but it all came together soon enough. 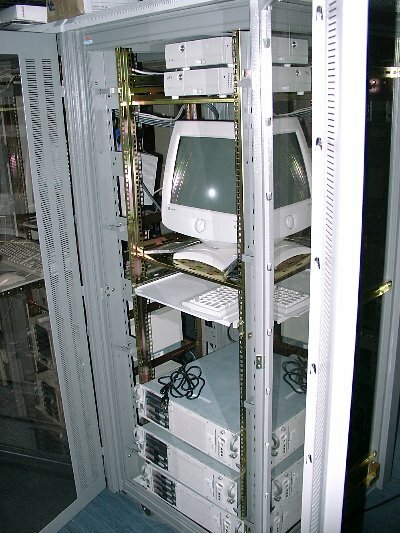 The first version of the CPE at this site had a hub for the two VocalTec gateways so the power supply had to be augmented with a additional power cable. The antenna was fairly typical, notice the block of wood to allow adjustment of the inclination in figure A.3.7.4 b. The First CPE in figure A.3.7.5 a had two GWs which as mentioned before didn't work with the Avaya EC. Unfortunately the GWs in Gelephu took a lot of hits from lightning so the second one was redeployed elsewhere while new ones were ordered. The second version of the Thinlaygang CPE used the Soekris SBC shown in figure A.3.7.5 b. Unfortunately the SBC developed a problem after the Consultant left so it had to be retired early. Perhaps another try can be made after more R&D is done. A lot of children in Thinlaygang have never even seen a telephone before so to have them at the school and in town was quite a change for everyone. Hopes are high that Internet access will be coming soon. 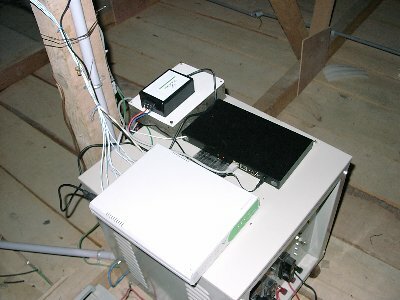 E-tel Corporation http://www.e-telcorp.com/ and their GW210 wireless gateway. Symbol Technologies http://www.symbol.com/ Makes the NetVision Phone.